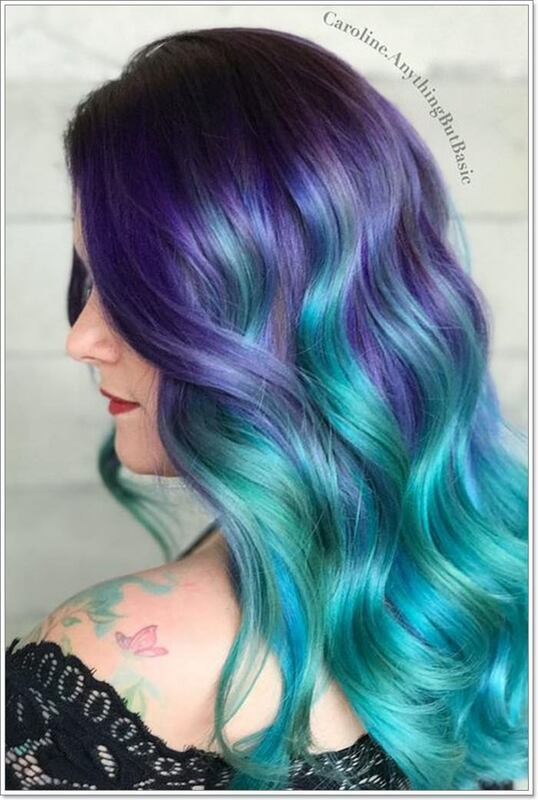 Mermaids may be a work of fiction but that doesn’t mean you can’t style your hair to look like one. 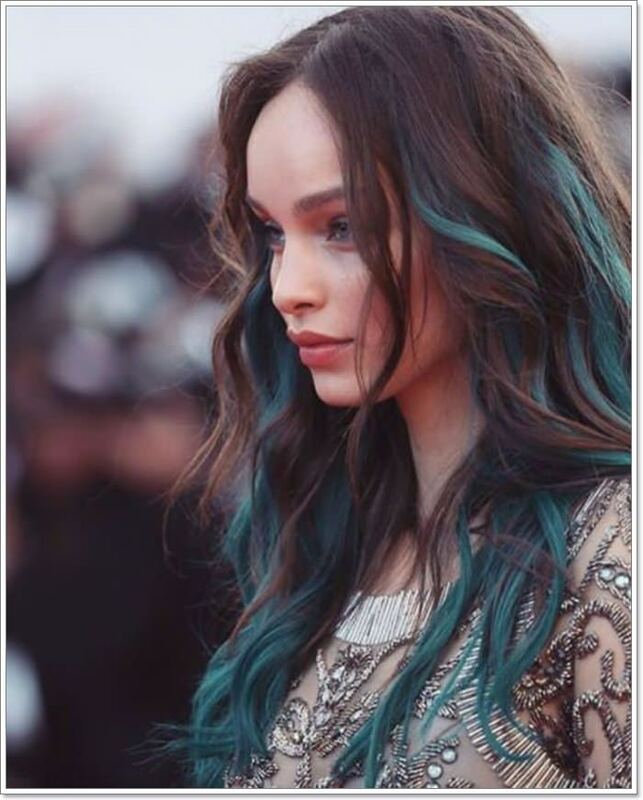 Growing in popularity over the past years, the mermaid hairstyle is an homage to the beautiful sirens of the sea. 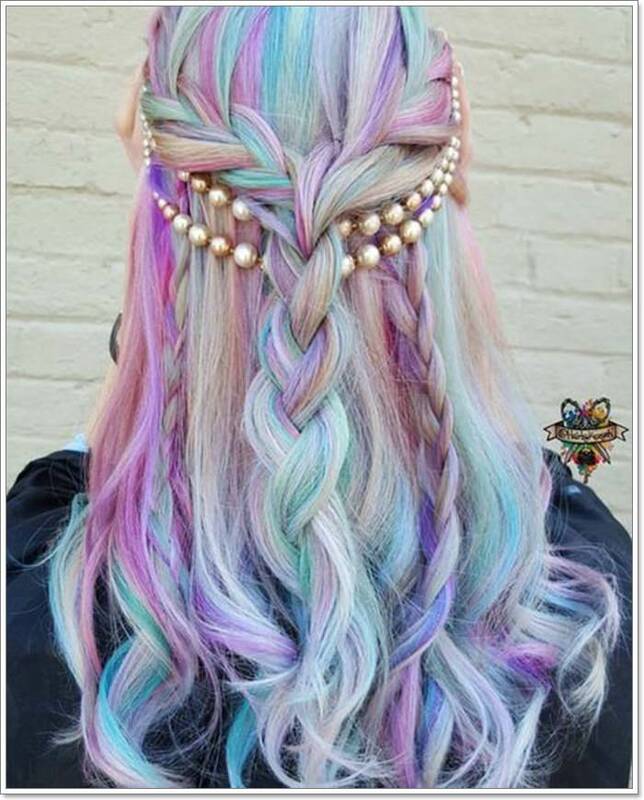 It’s usually characterized by long hair styled with a variety of braids, waves and colors. Get yourself ready for spring and summer. 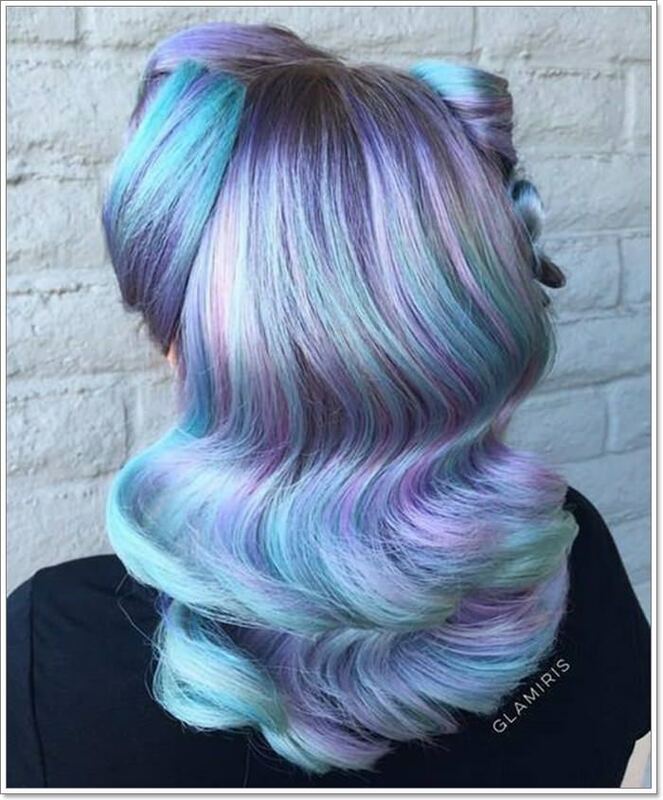 Find inspiration in these absolutely gorgeous mermaid hairstyles. 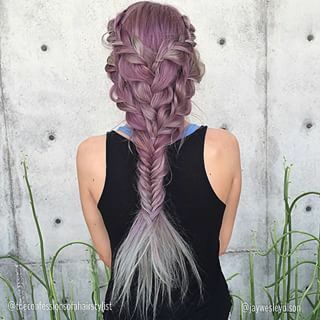 Nothing says mermaid hair as straightforward as fishtail braids. 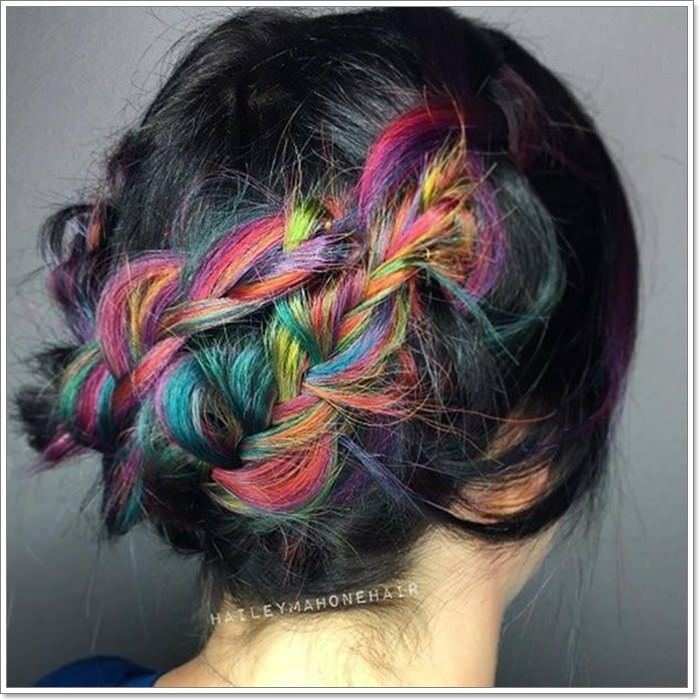 The two-strand braid is also pretty versatile as you can incorporate it into other hairstyles as an alternative to regular three-strand braids. 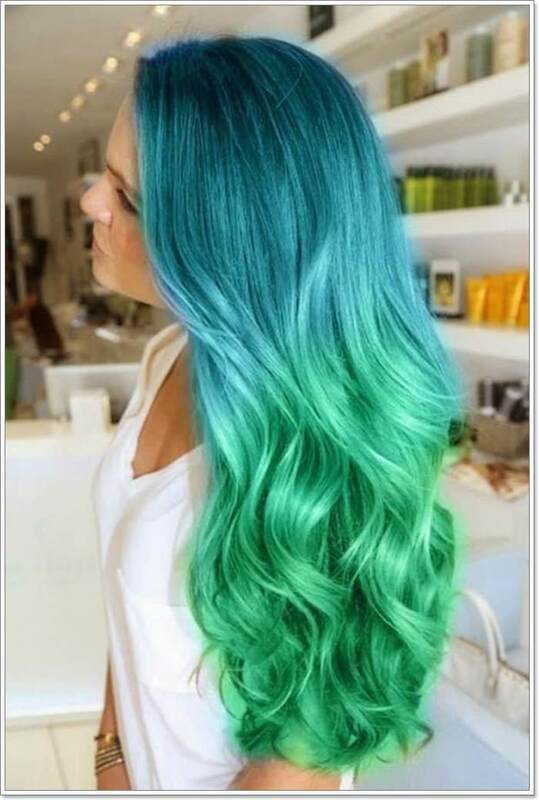 Of course, you can never go wrong with seaweed green hair if you’re going for that just-stepped-out-of-the-sea look. Another great thing about the color is that it flatters a wide array of skin tones. 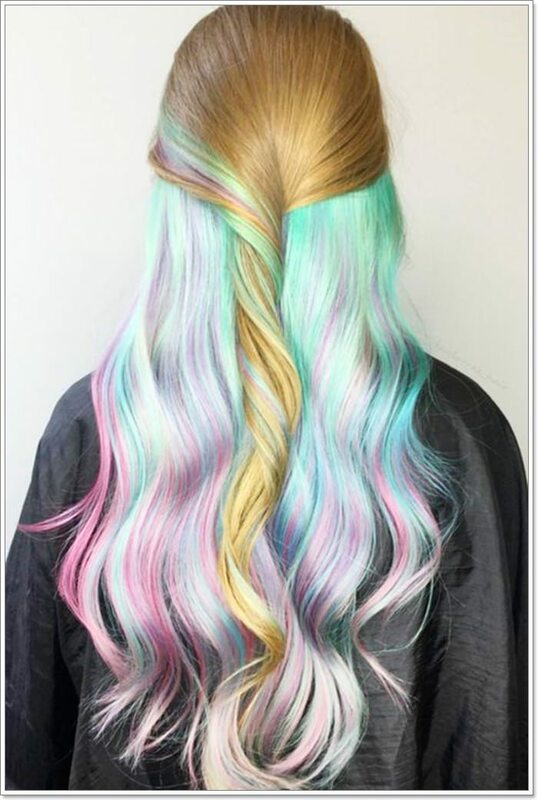 Multi-colored pastel hair is another popular style for mermaid hair. 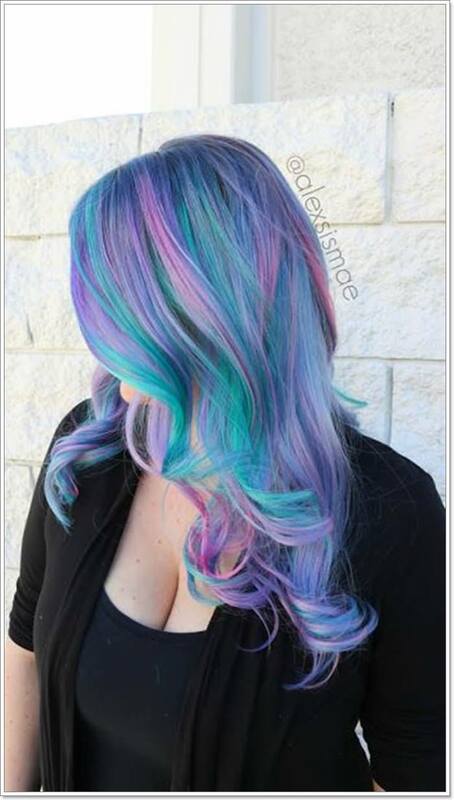 The mix of three or more colors gives dimension to the hair and give it the illusion of underwater movement. 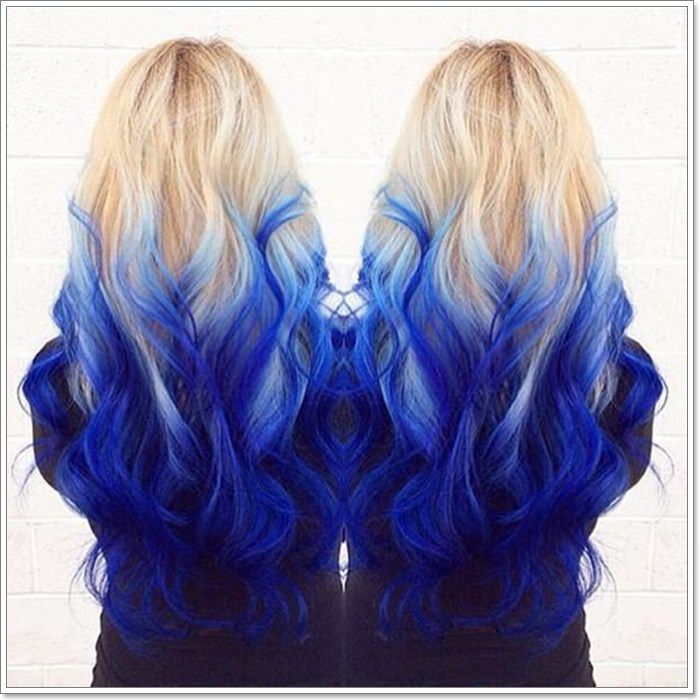 Give the classic ombre color a twist by opting for bluish hues to pay homage to the colors of the ocean. 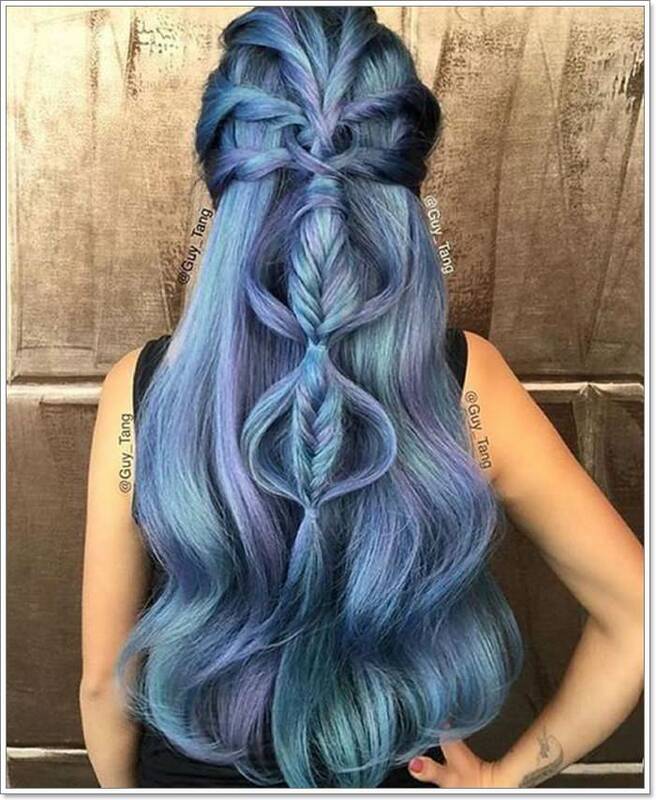 This pull-through braid on long hair just screams off-duty mermaid, doesn’t it? If you’re not up to something as permanent as coloring your hair, a simple crown of starfish would do. 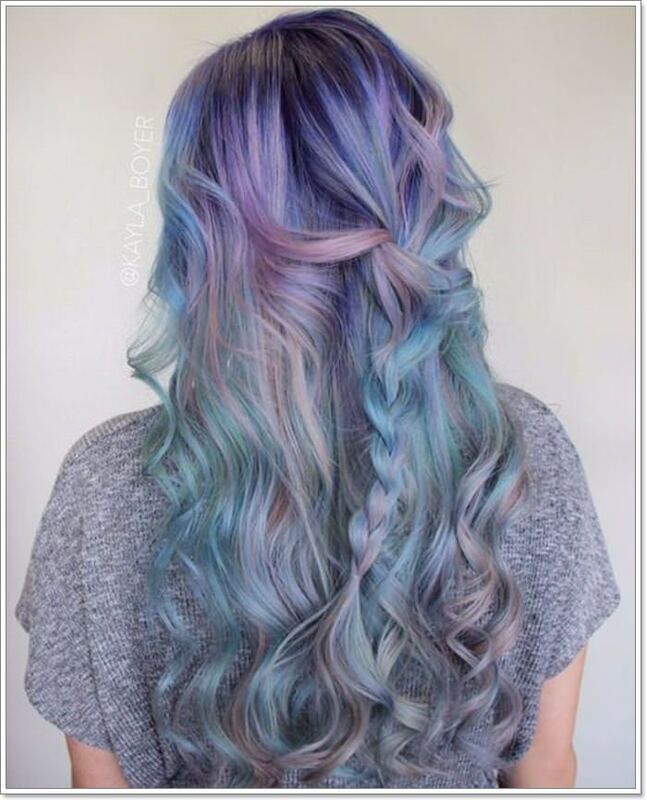 Long light-colored hair is a great canvas for mermaid hairstyles. Pro tip: Stick to loose or messy hairstyles to achieve a carefree, siren of the sea look. 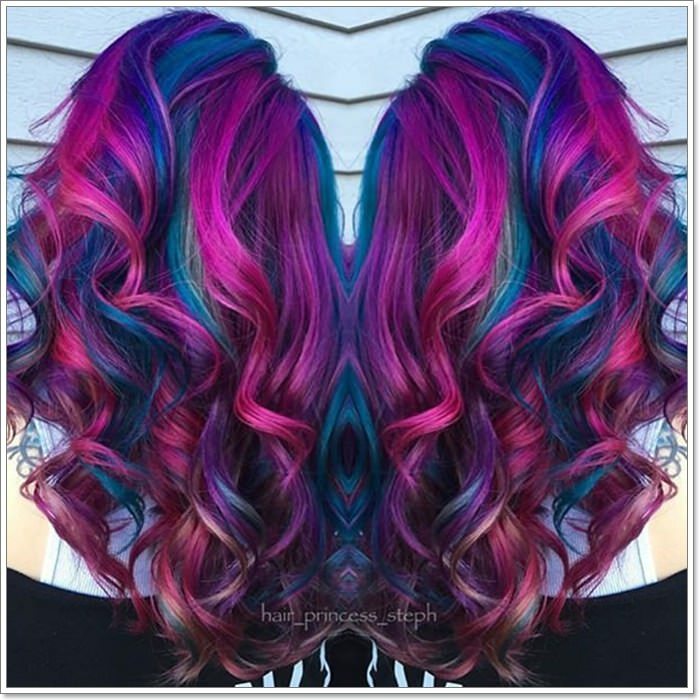 Channel the colorful world underneath the sea surface with this tri-tone ombre hair. Try out some halo braids and any sea-themed hair accessory like the one above and you’ll look just at home lounging by the beach. 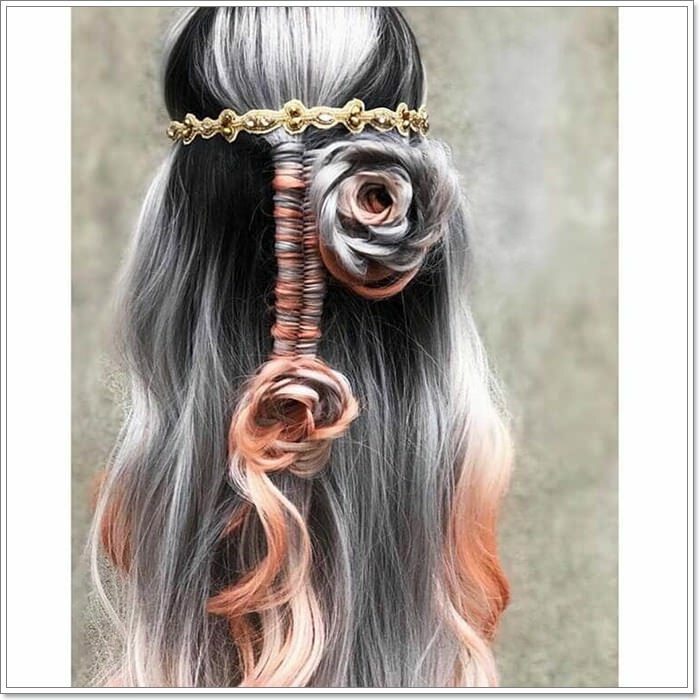 Add a dash of fab to an otherwise boring fishtail style with a thin metallic crown. 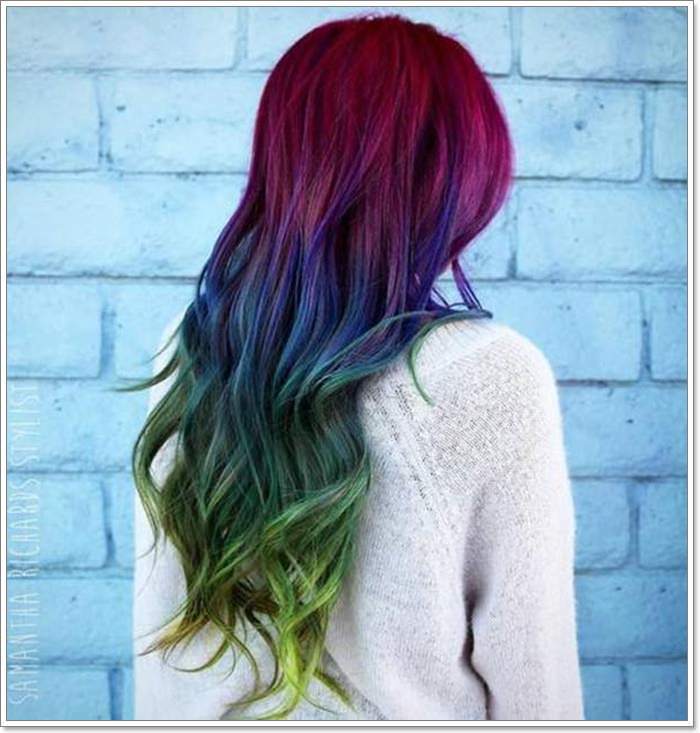 Multi-colored hair looks great when styled into thin, wispy waves that emphasize the melding of each color. 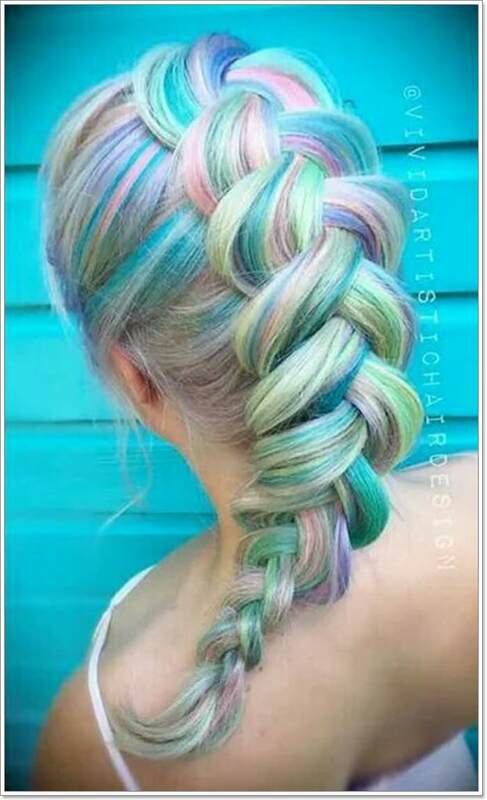 And if you’re up to something more put together, a wraparound braided updo pairs well with rainbow hair too. This look would be very fitting for beach weddings. 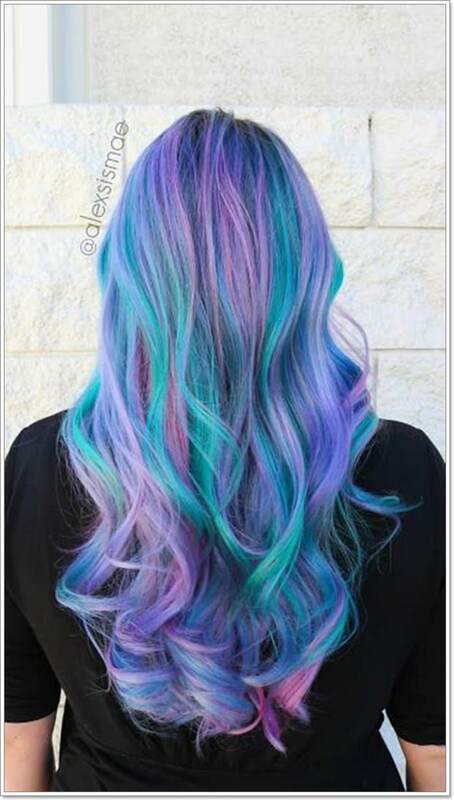 Be an undercover mermaid on a land mission with a hidden colorful layer of hair. 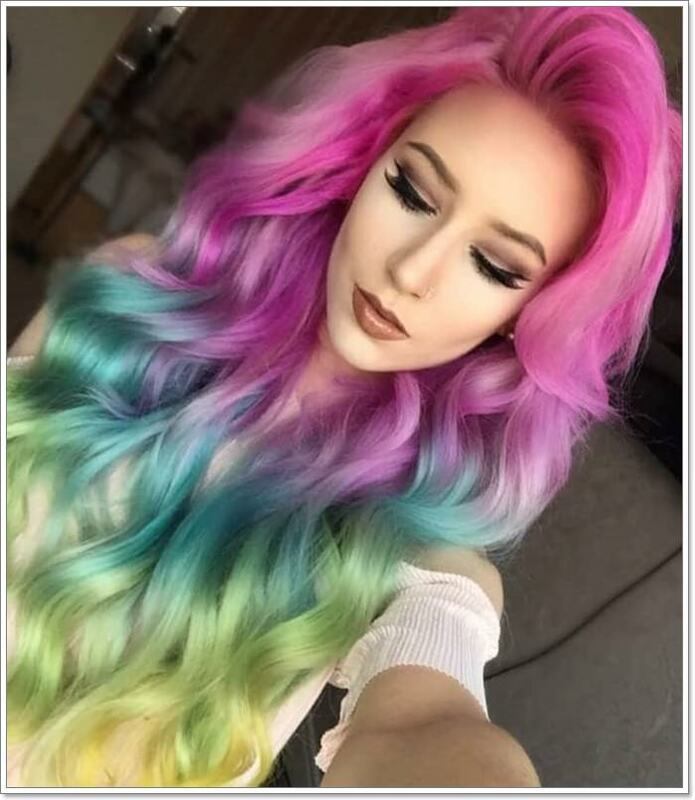 This style particularly looks good on extra long hair. 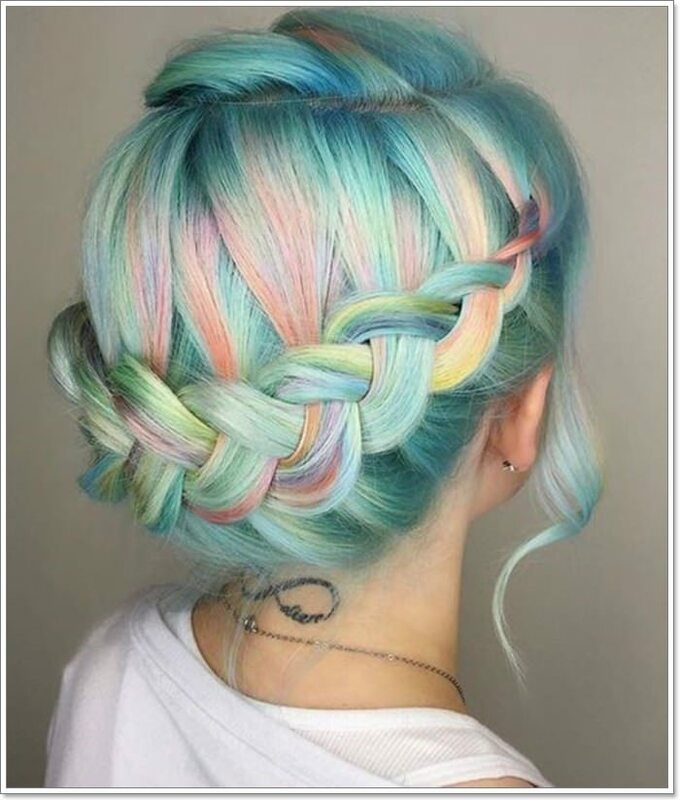 Show off your ‘true colors’ by styling your hair in a bun. 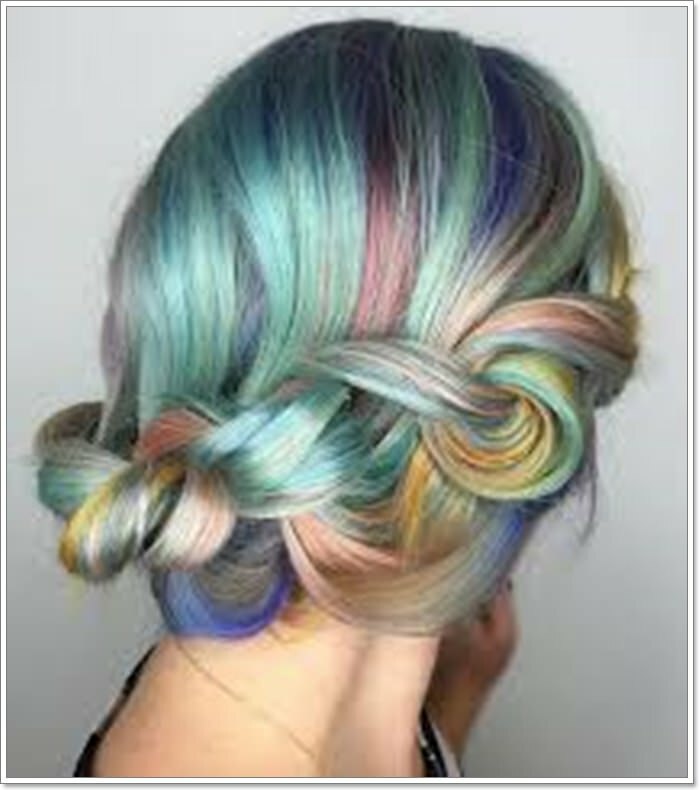 Just look at how the colorful strands mix with the natural ones, isn’t it cute? 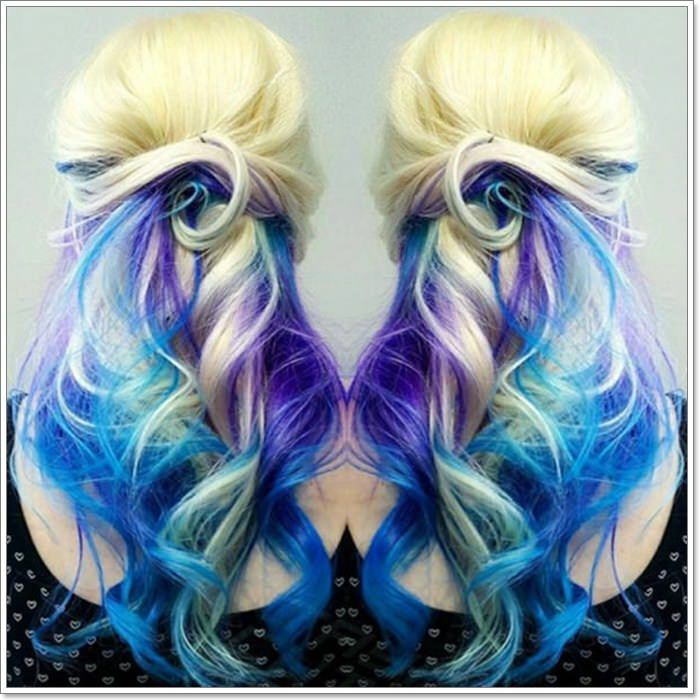 Get a little more creative in showcasing a fantastic dye job and tie half of your hair into a side bow hairstyle. 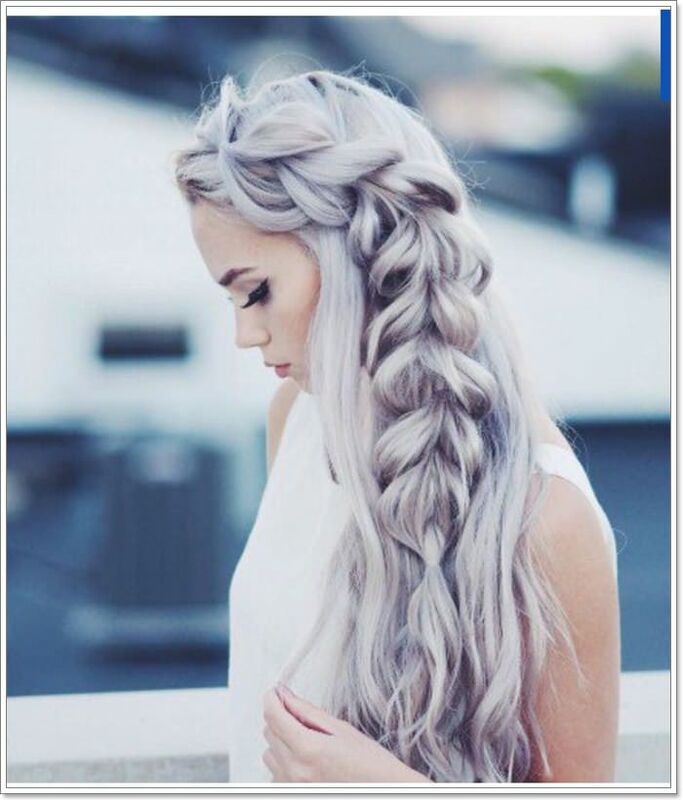 Remember the pull through braid we mentioned about above? 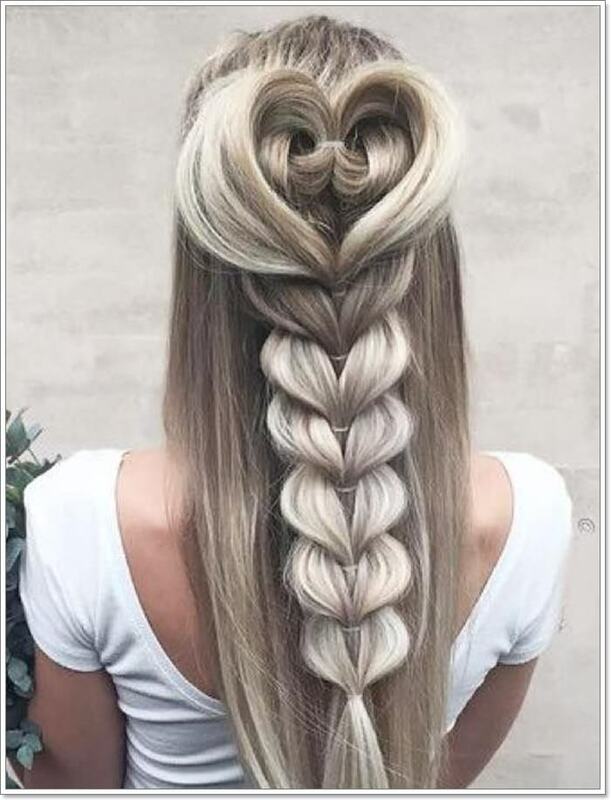 Give it a creative twist by styling the top braid into a big heart. Sometimes three colors just don’t cut it. 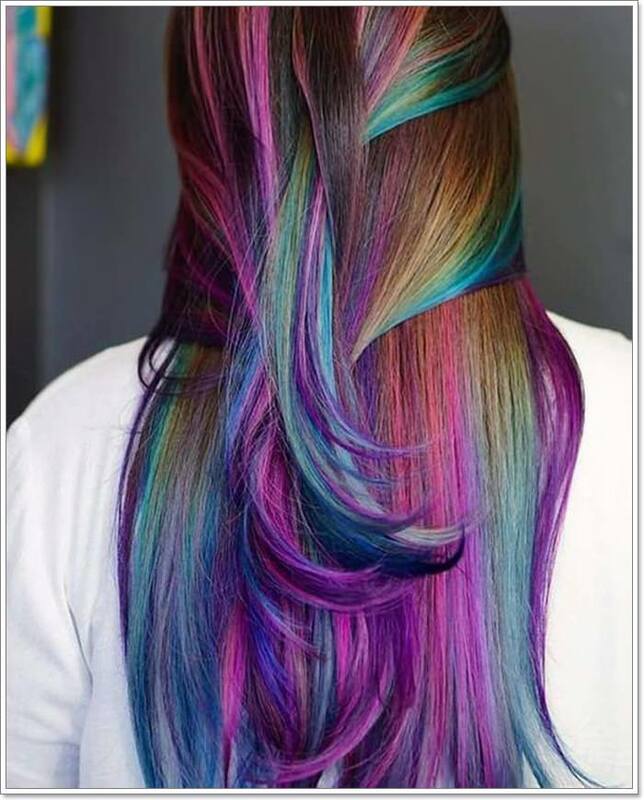 So, take the extra step and incorporate more color into your hair. This cool-toned look will perfectly fit girls who have a cooler skin tone. 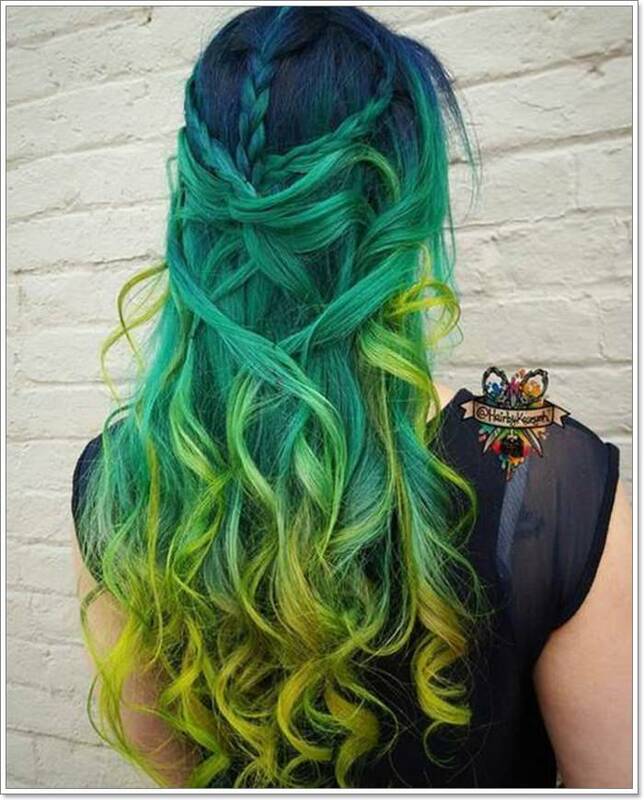 Add some sunshine to cool-toned hair with a dash of bright yellow here and there. 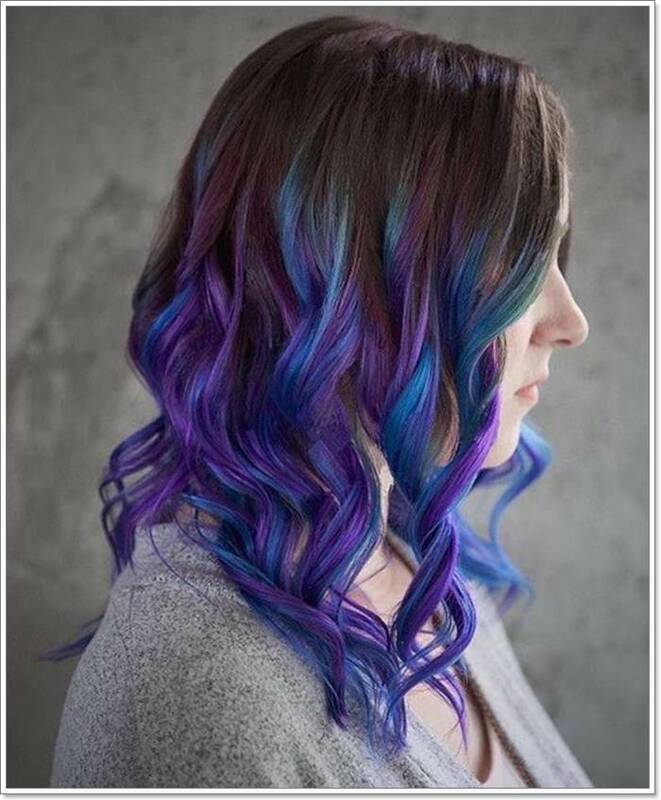 If you want to stand out among the sea of mermaid-haired girls at the beach, go for something as bold as this ultraviolet hair. Add some large beach curls to your hair to complete the look. If you have light brown or blonde hair, this is the perfect style for you. 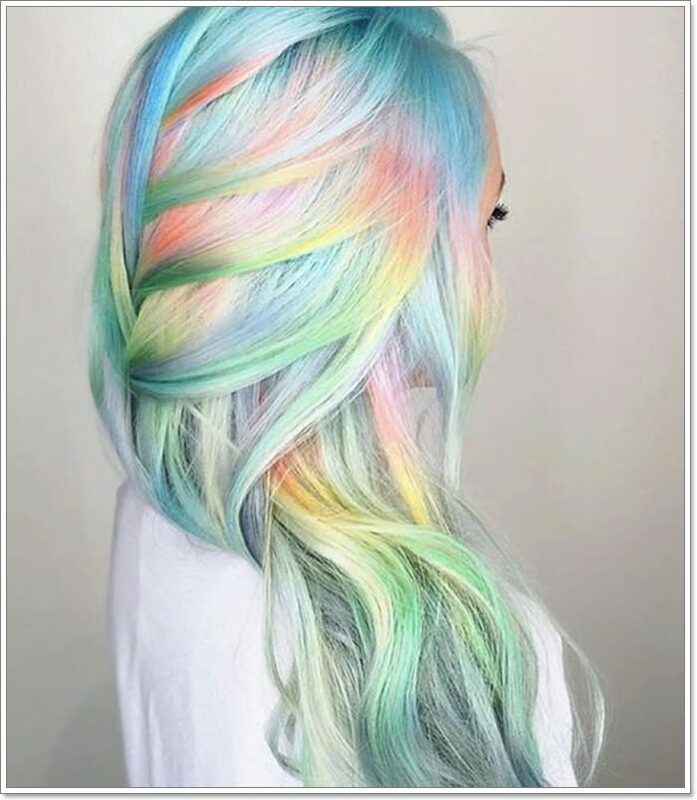 Because your hair doesn’t need bleaching for the colors to show through, you’ll have more opportunity to change up your color combinations over the summer vacation. Add some softness to a blunt A-line lob cut and incorporate some loose fishtail braids into your hair. 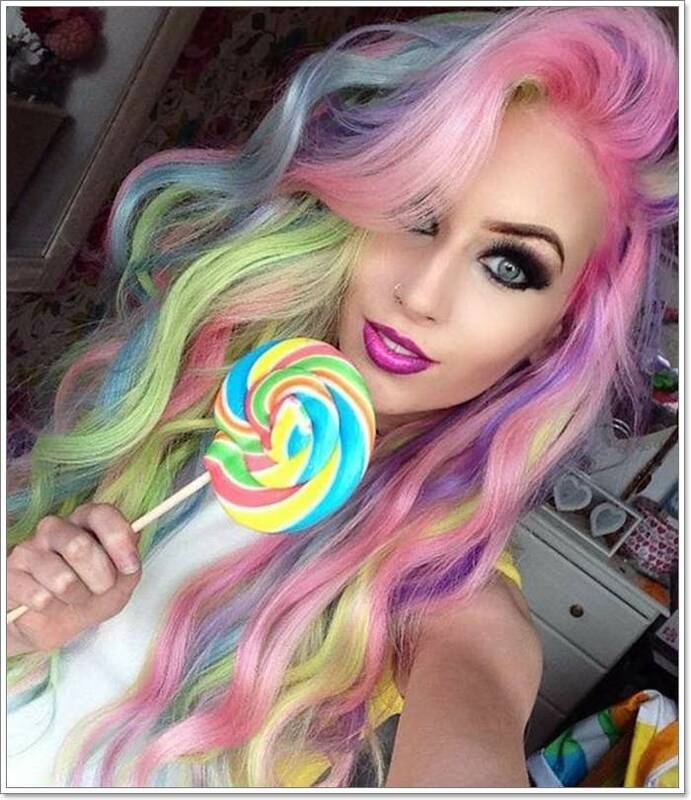 This is another great style for light-haired girls. 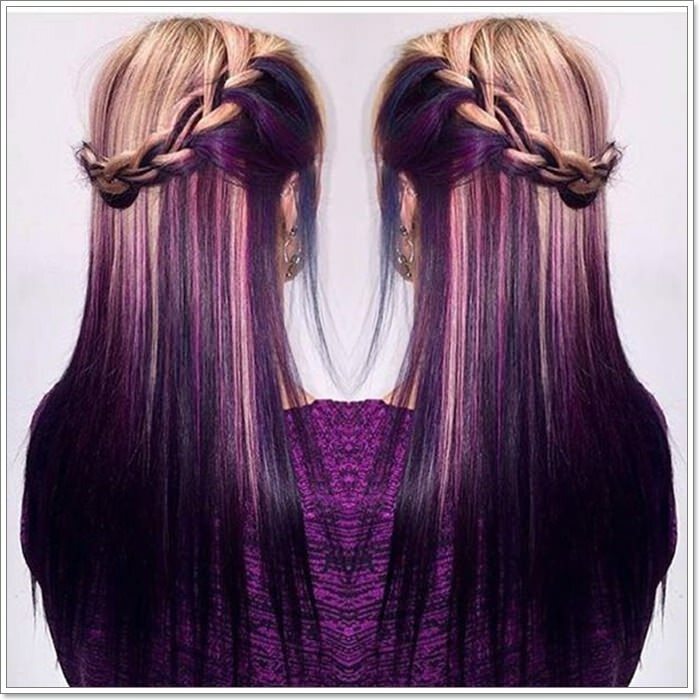 It’s best paired with a halo braid to emphasize the color transition from blonde to dark violet. 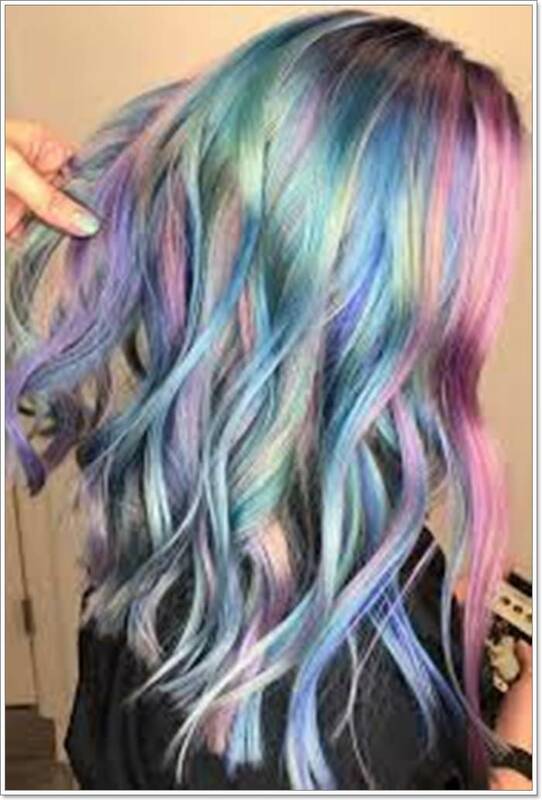 Not yet ready to fully commit to the mermaid life? 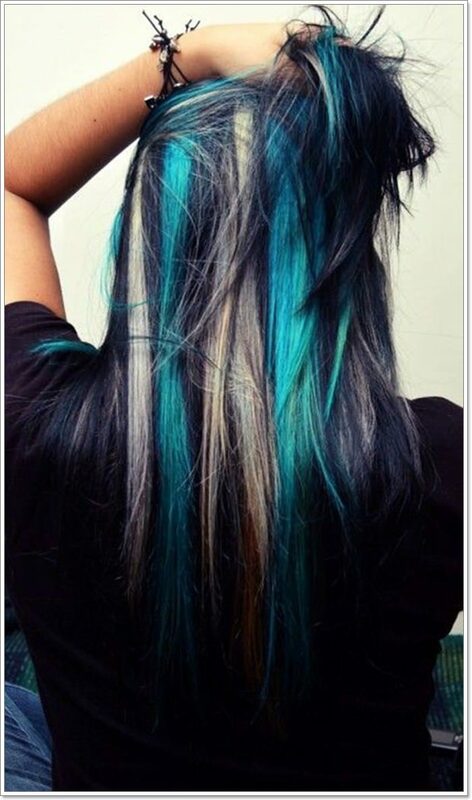 Test the waters with some blue green highlights. 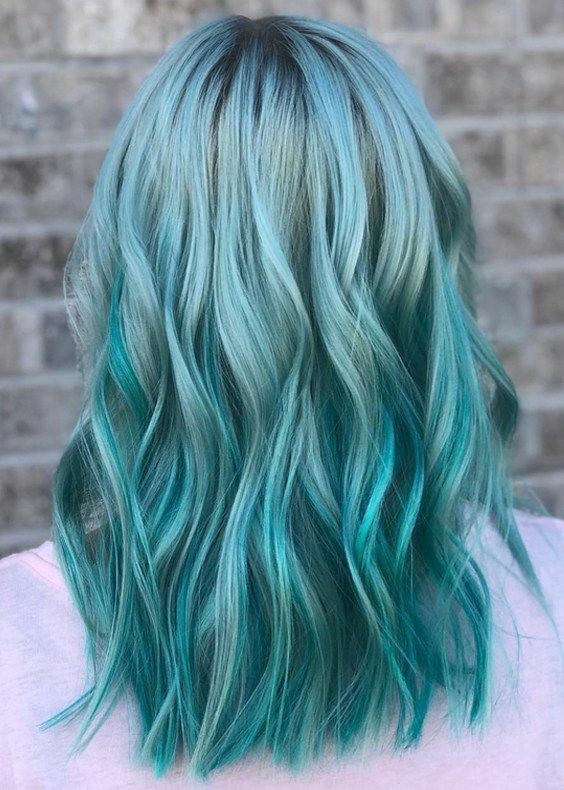 Who says mermaid hair has to be long? 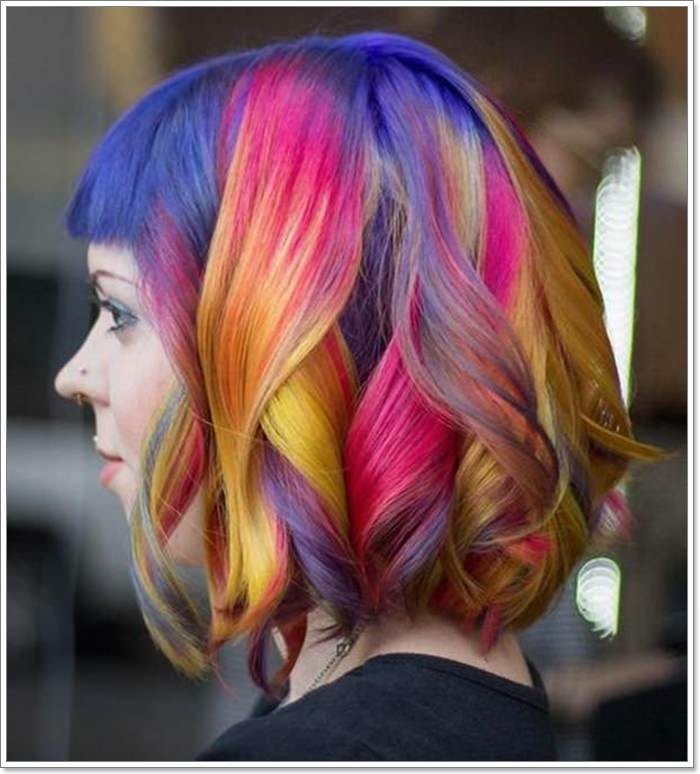 Short-haired girls can also pull off the style with some bright colors and soft curls. 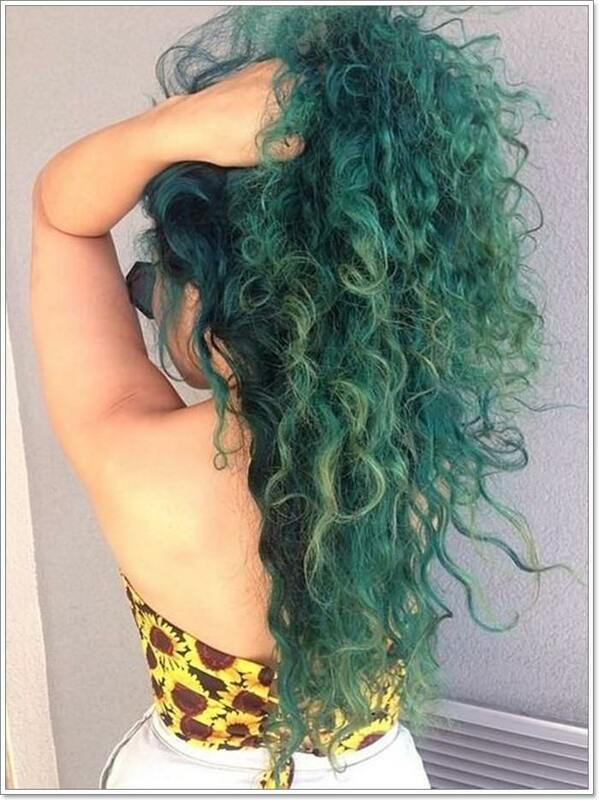 When it comes to mermaid hair, the messier the better. But keep your hair calculatedly messy instead of just uncombed and unstyled. If you’re not a fantastic braider, go for hair twists instead. Mermaids have been around for a long time, so it’s completely logical to see ones with hair styled into a 40’s coif, right? 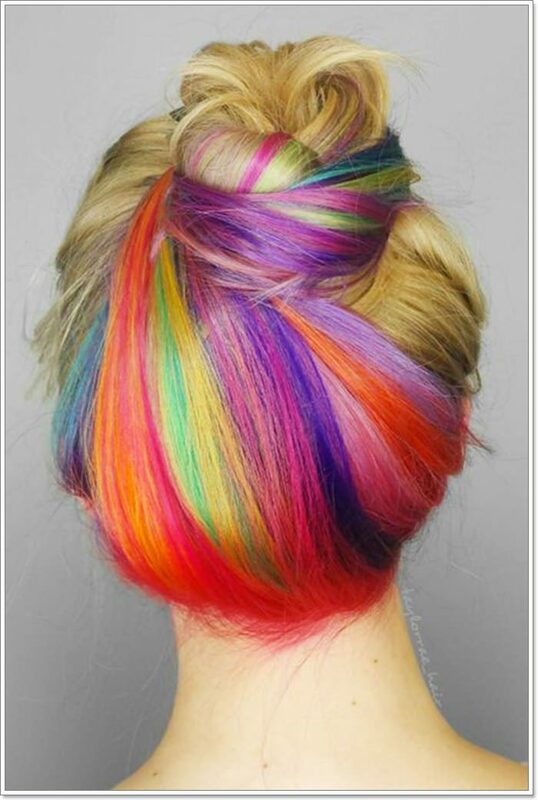 The contrast of dark hair and bright ombre hair is showcased in this messy updo. 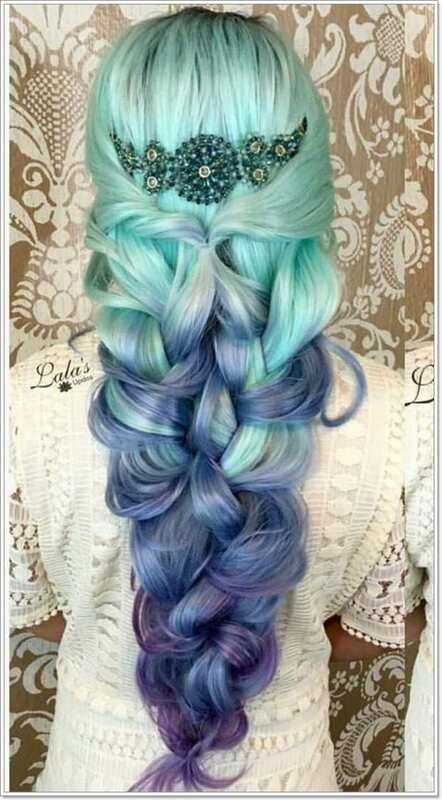 Secure your crown as the queen of the sea with this regal hairstyle of small braids, wispy curls and blue green hair. 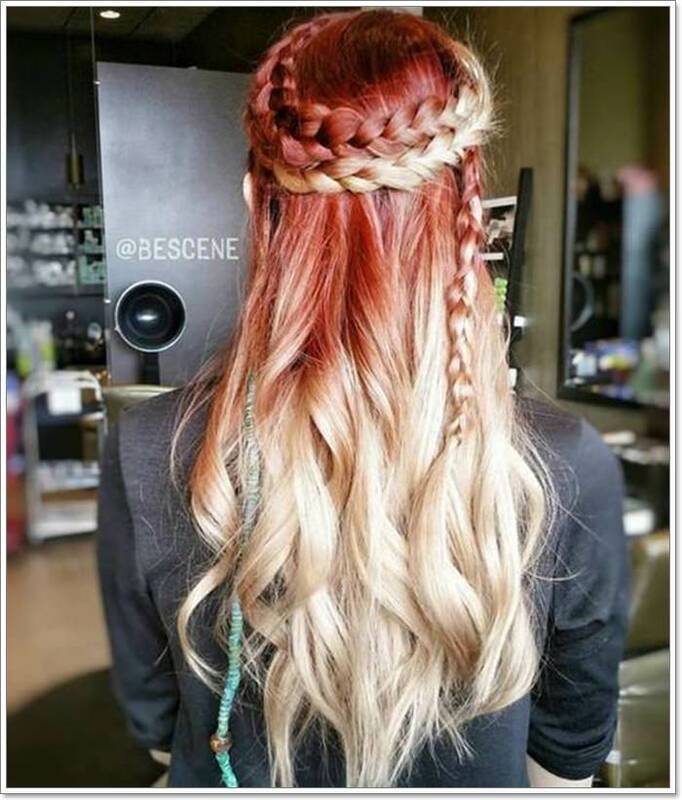 Hair with bright highlights makes for a multi-dimensional Dutch braid. 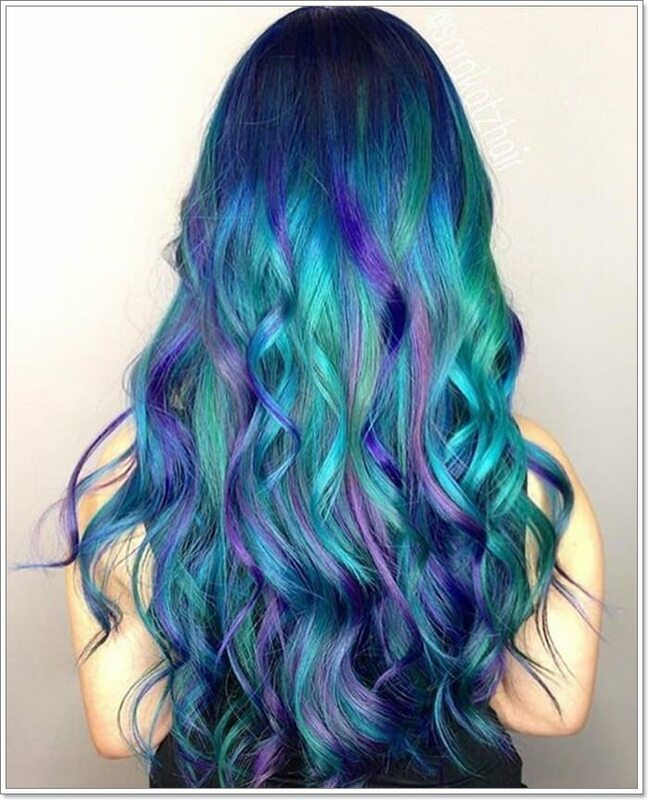 If Helen of Troy was a mermaid, this is definitely what her hair would look like. 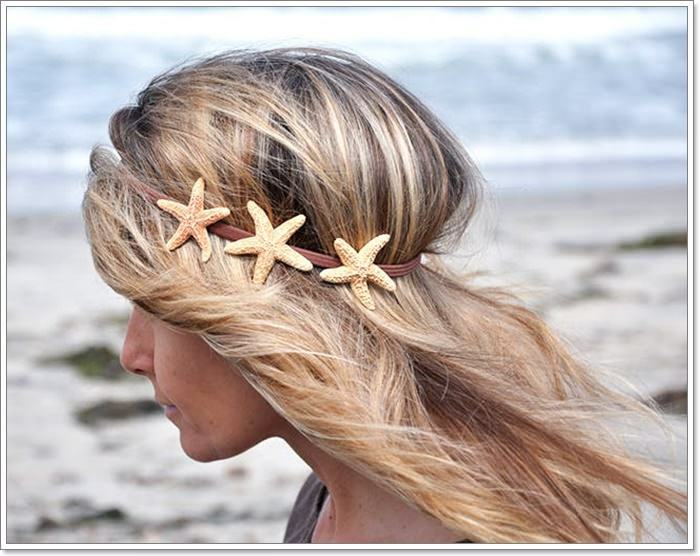 Steal the look by tying your hair into a crowning braid and adding some sea-themed accessories to your hair. Sometimes subtlety can speak more loudly than bold statements. Get creative with your color combinations. 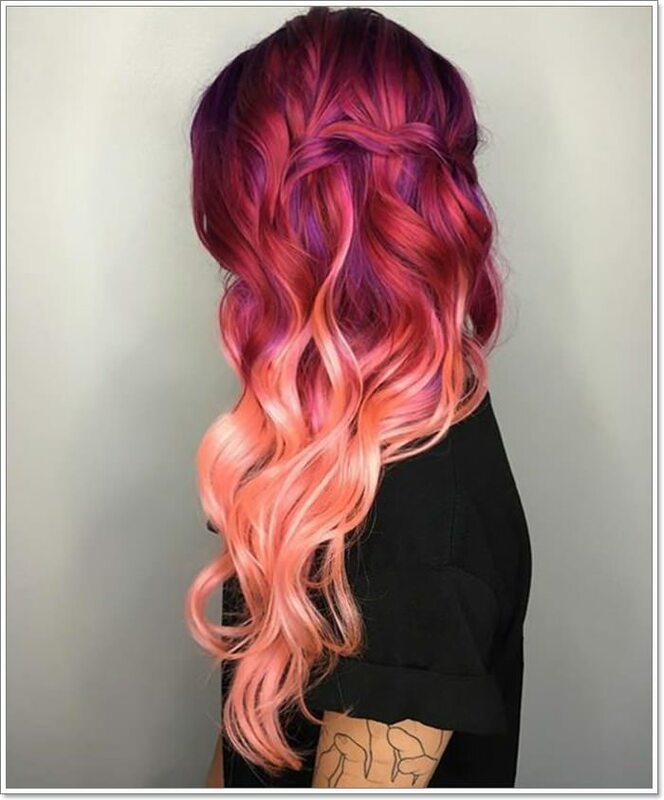 Peachy pink and dark red hair totally work for mermaid hairstyles, too! See what we mean? After all, Ariel, probably the most famous mermaid, is a redhead. 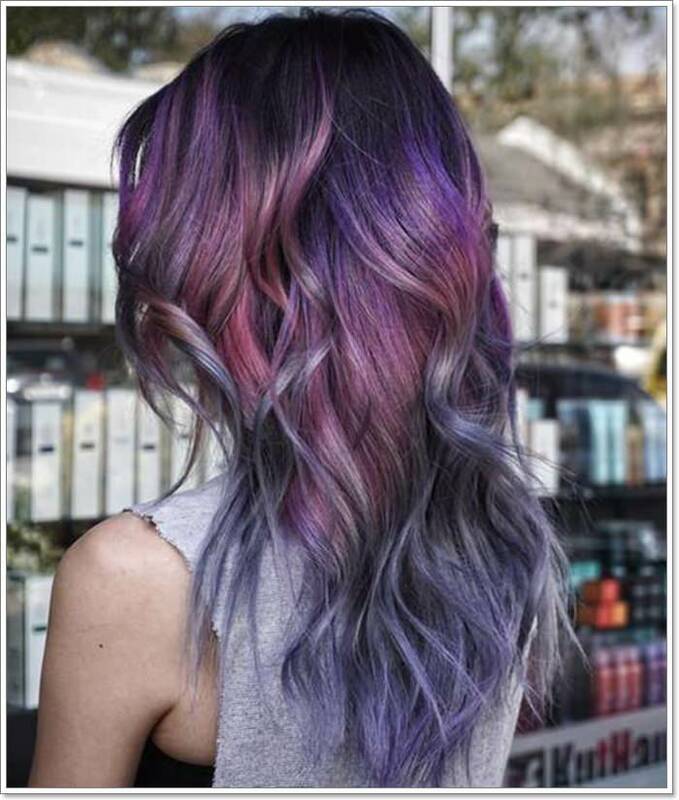 Go for a more mysterious look by opting for a dark to light purplish ombre. Give it some slight edge by incorporating blunt half curls. 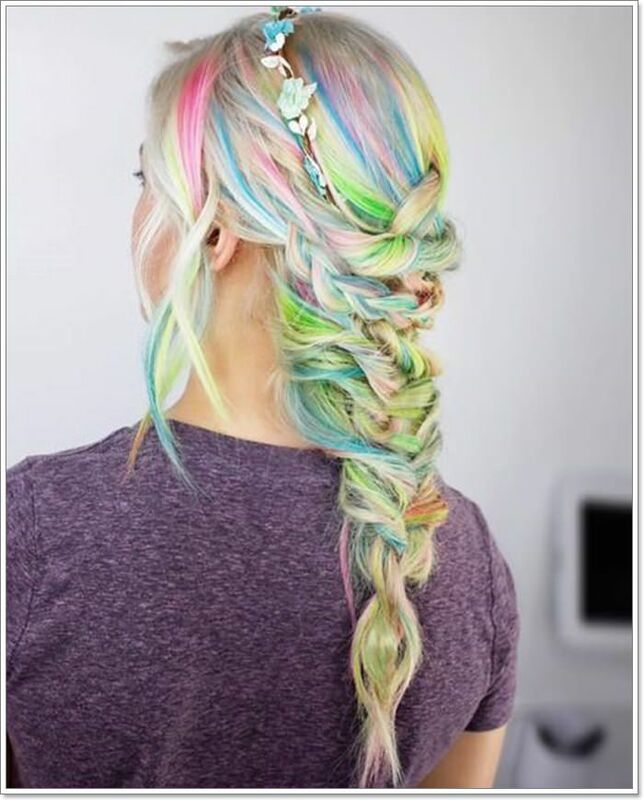 This rainbow highlighted blonde hair braid look is the perfect one to wear to a beach wedding, don’t you think? 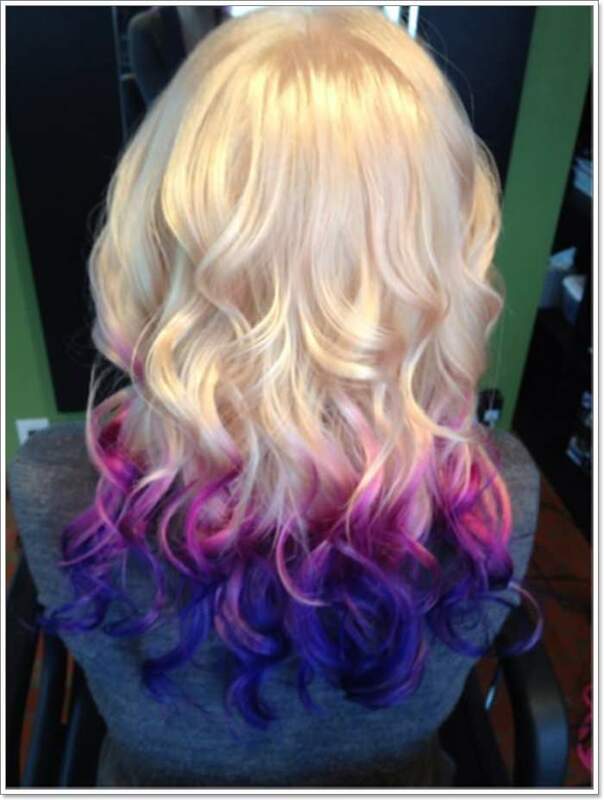 Stand out with this high contrast hairstyle of platinum blonde to dark violet red ombre. Take a flat iron and add some bouncy curls to dyed hair. 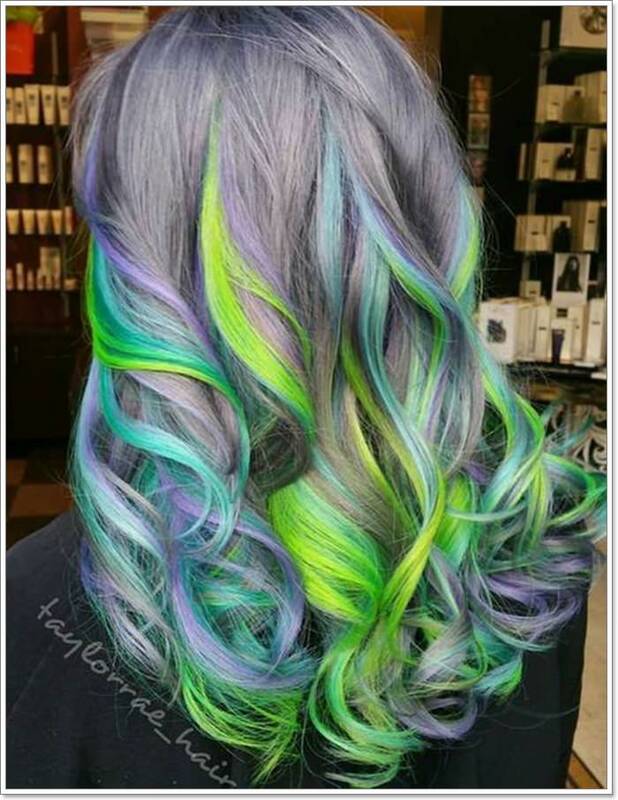 There’s just something so attention-grabbing about neon green mixed with cool colors like silver and purple. Girls with natural curls are so lucky. Their hair is practically made to pull off mermaid hair. Just be sure to keep your locks moisturized when you’re at the beach to avoid summer frizz. 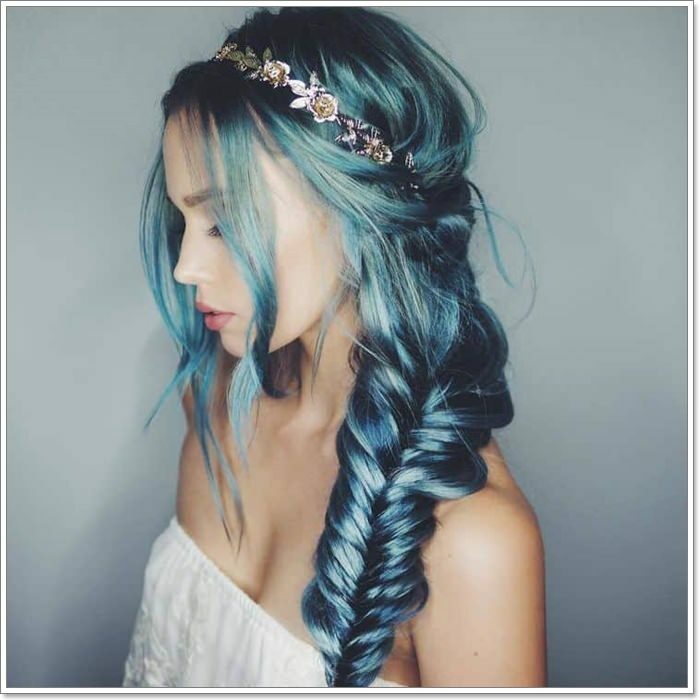 Give Aquamarine a run for her money with this sea-tastic braided hairstyle. We told you starfish hair clips are the bomb. 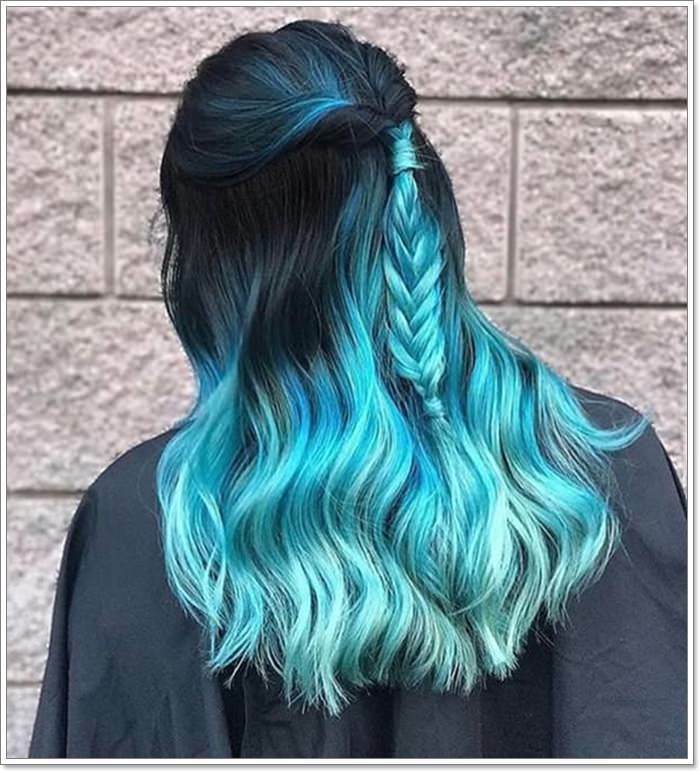 Not a fan of blue hair? 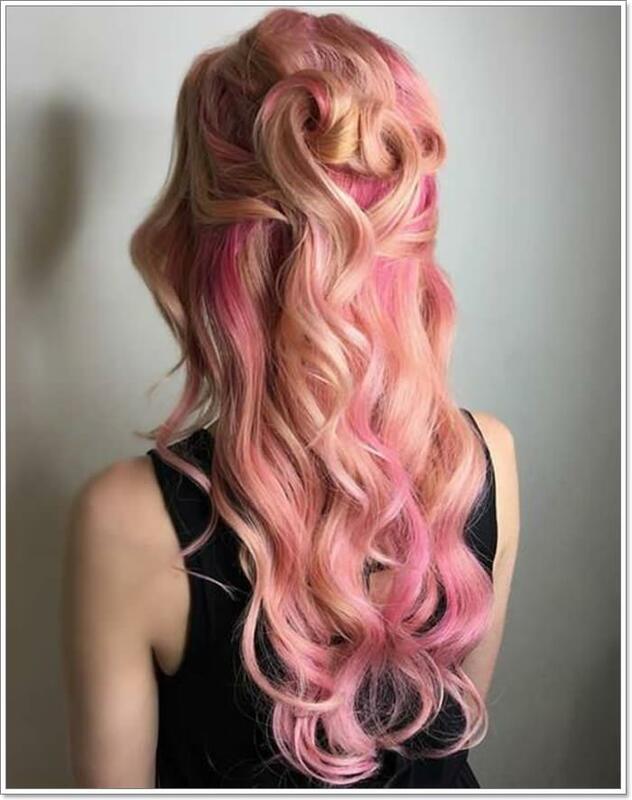 Don’t worry you can still pull off a mermaid hairstyle with warmer colors like peach pink. 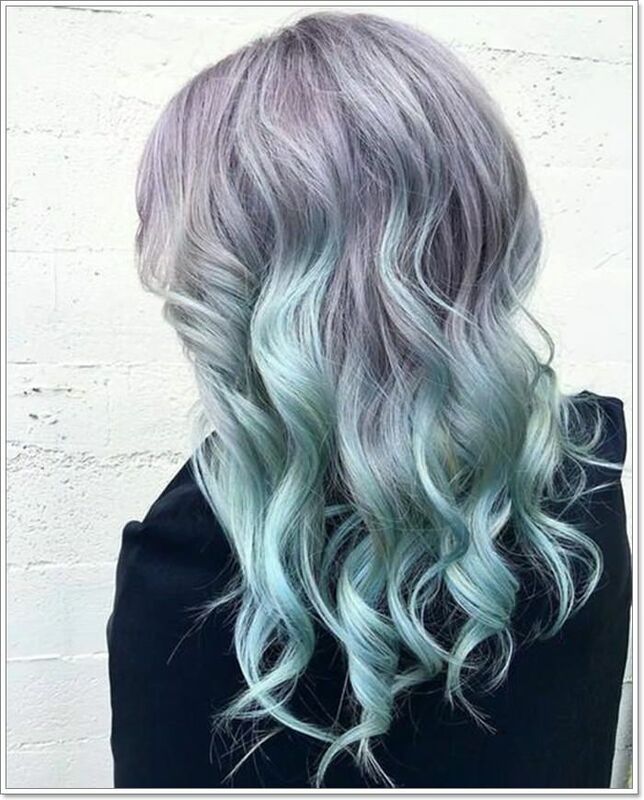 Go for a lowkey look and opt for some dusty and faded color combinations like this seamless silver to light blue ombre. 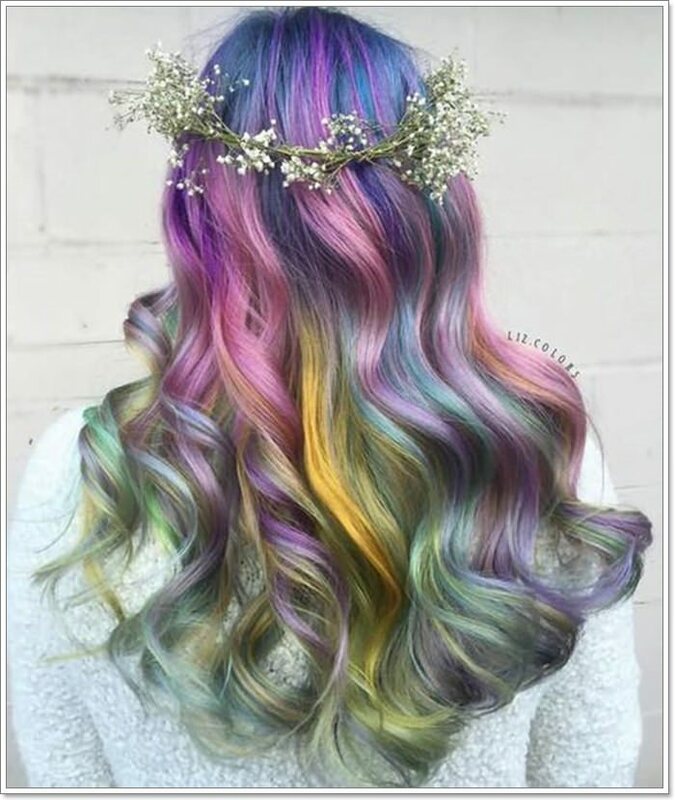 Long and layered hair is the perfect canvas for this rainbow color ombre. Look put-together without looking like you tried too hard. 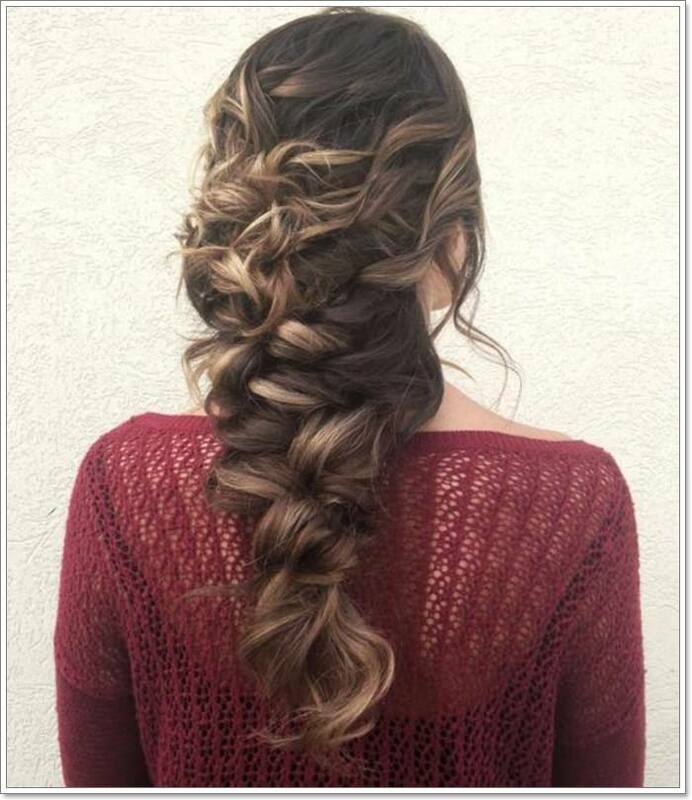 Style your hair with a twisted half updo and loose flowing curls. 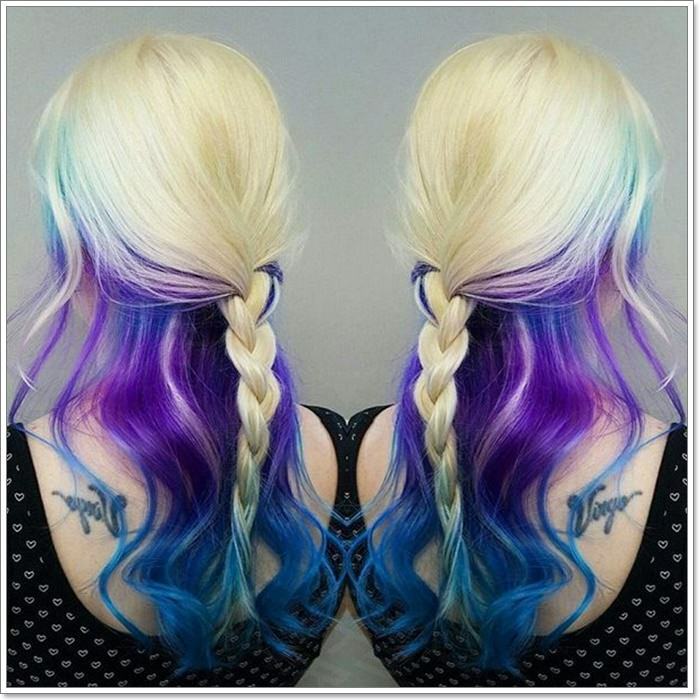 You can never go wrong with a blue and violet combo. Get beach babe waves and start curling your hair from the roots down to the ends. This would also give your hair some texture and body. 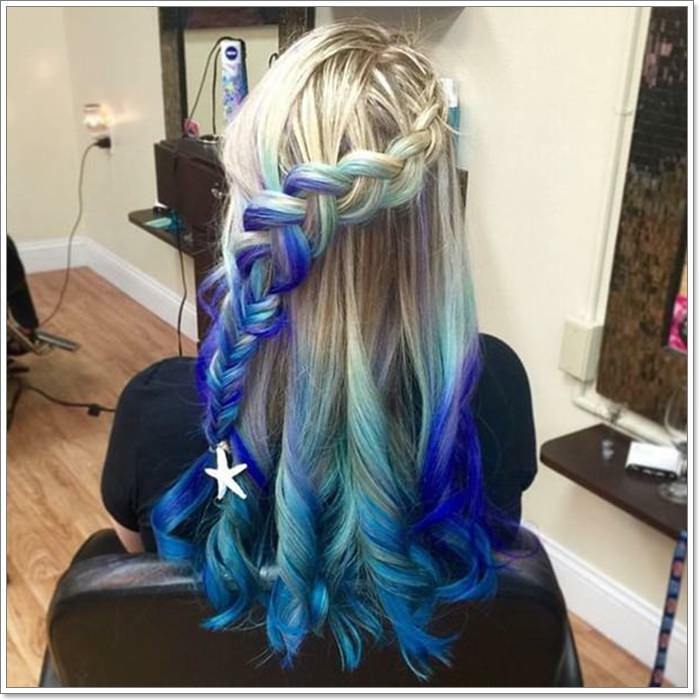 Give a regular Dutch braid a mermaid makeover and incorporate some bright highlights to your hair. 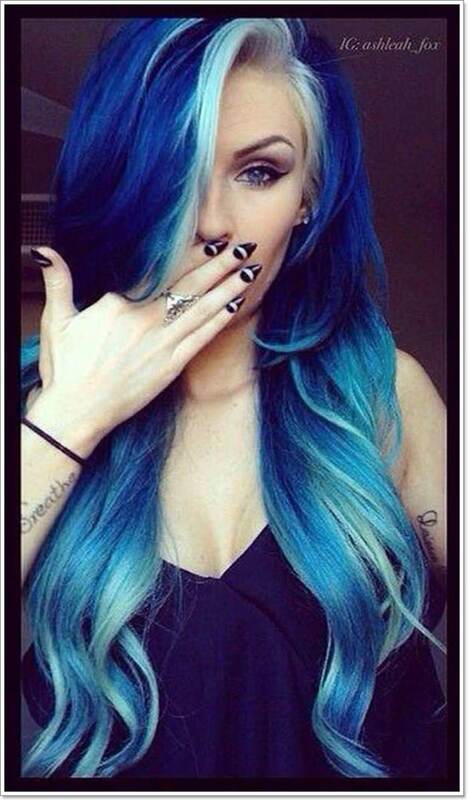 Pay homage to the ocean with a true blue ombre. You know how the light of the sun hitting the water creates the illusion of little rainbows on the sea surface? This is what that will look like when recreated onto hair. 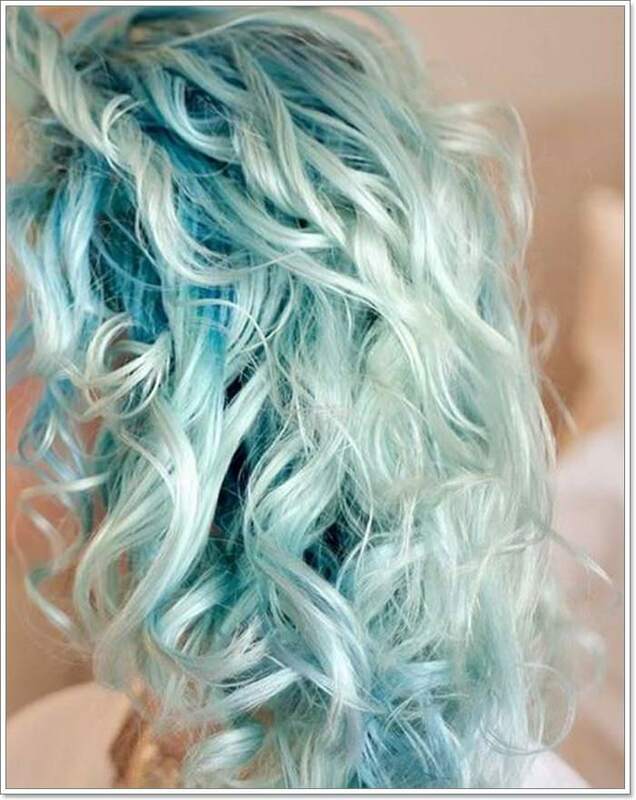 Recreate the waves of the sea onto your hair with an aquamarine ombre and loose curls. 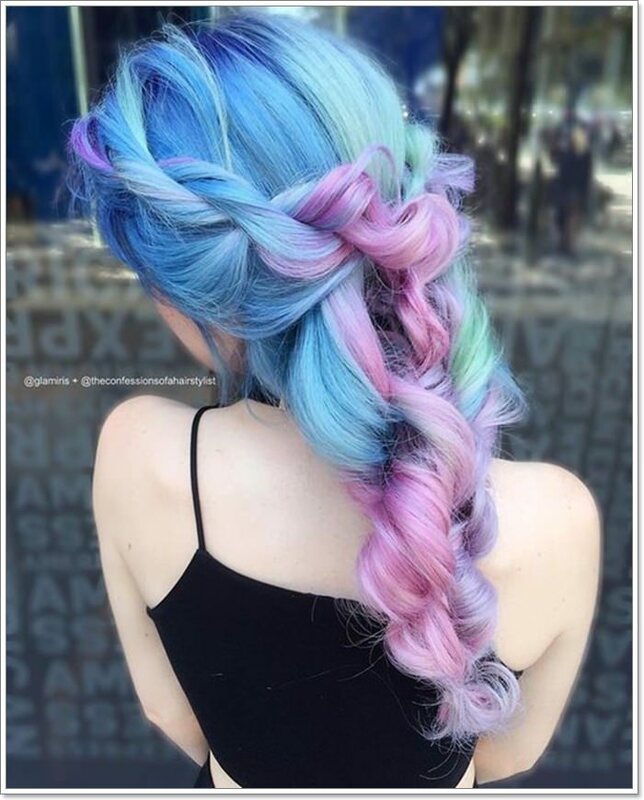 This style gives a new meaning to layered hair. 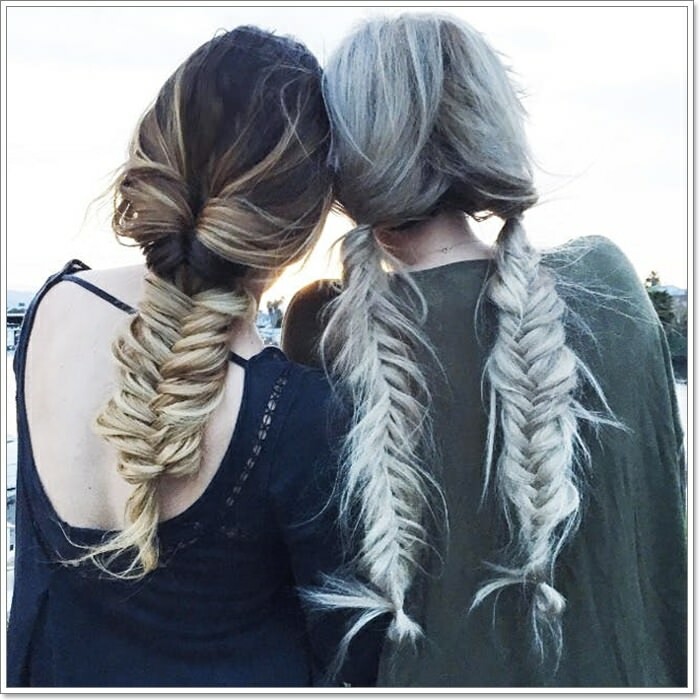 We told you mixing braid types in one style makes for the prettiest mermaid hairstyle. Believe us now? 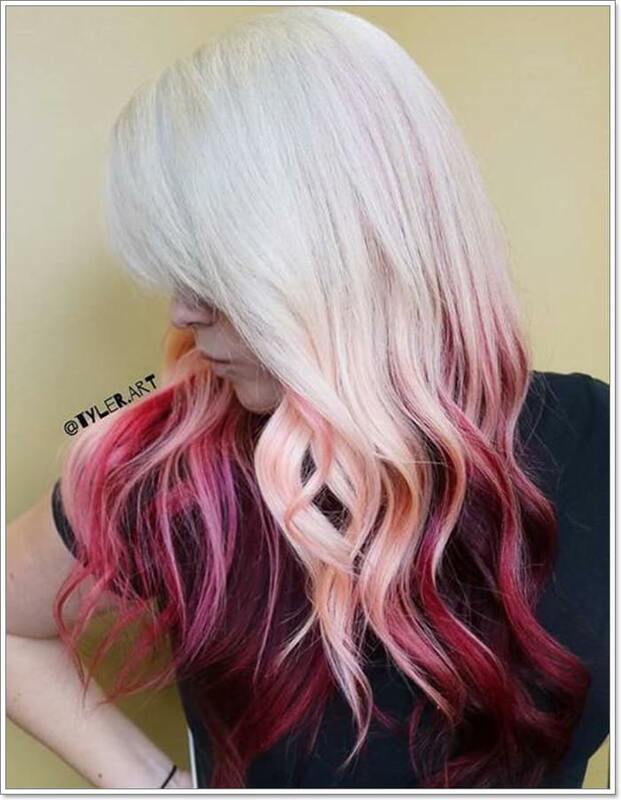 Keeping bright dyes on the bottom part of the hair gives you the option to easily cut the color off at the end of the summer. Too bad some schools still have strict rules against colored hair. It’s a shame mermaids aren’t typically depicted with dark hair. 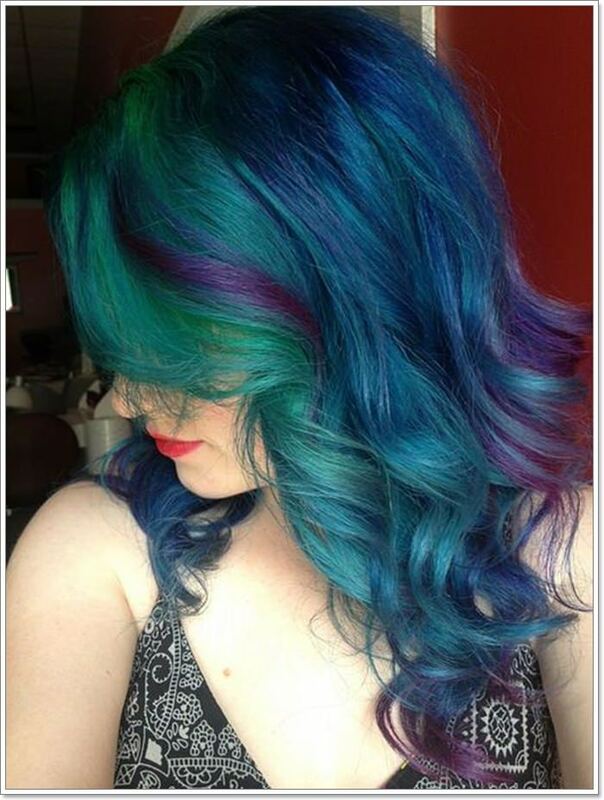 Just look at this gorgeous black and blue green hair combo and tell us it doesn’t remind you of the sea. 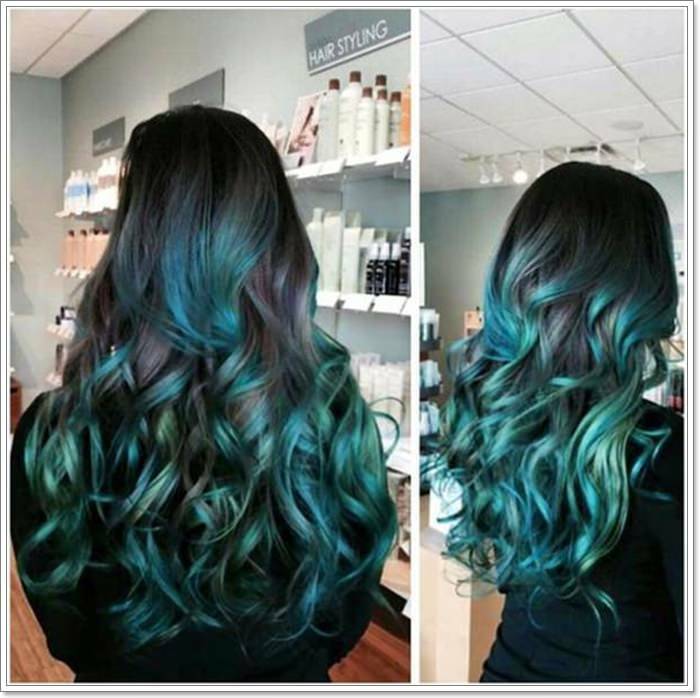 Blue and green also works well even when separated into an ombre style. Good news to pixie-haired girls! 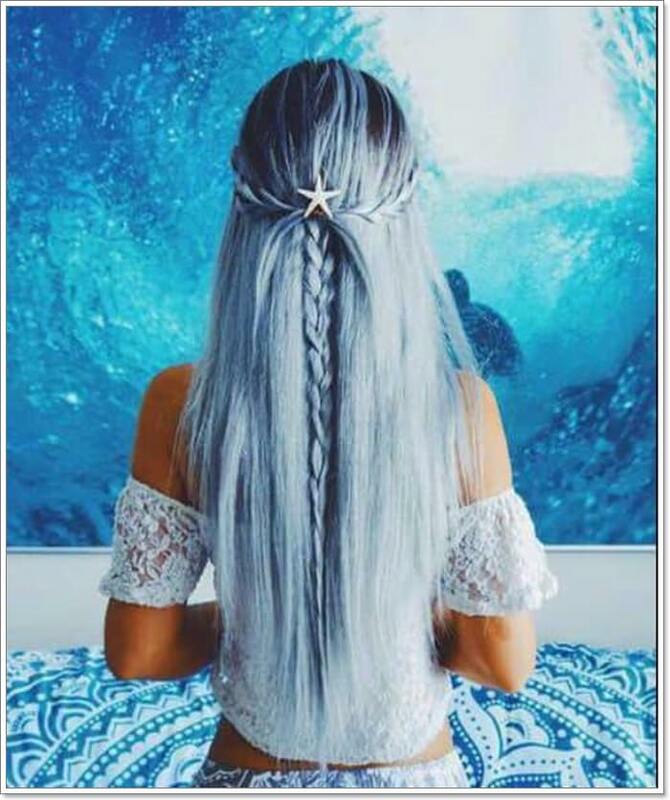 You can definitely pull off mermaid hair too. Sometimes all you need is long hair and a fishtail braid. 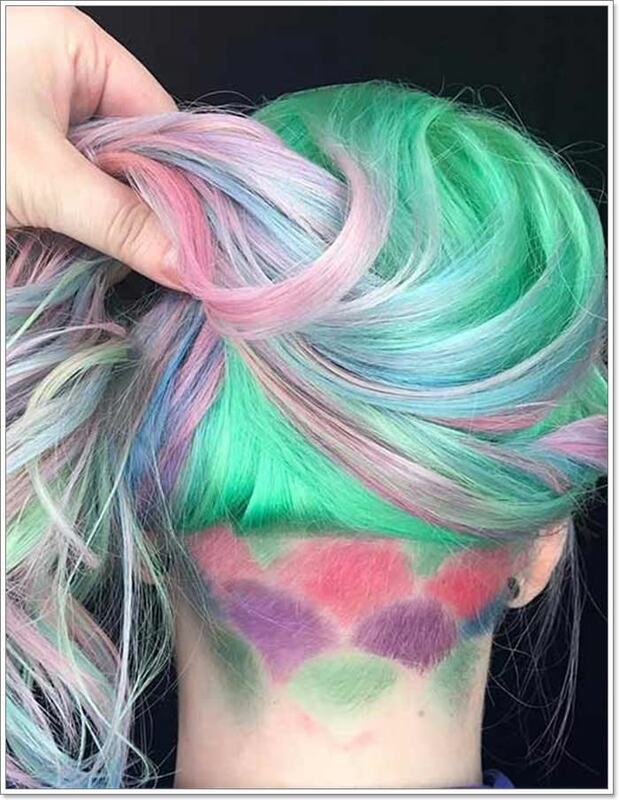 We gotta praise the creative yet subtle homage to the sea this hairstyle has. See that hair clip at the end? Got extra time to style your hair? 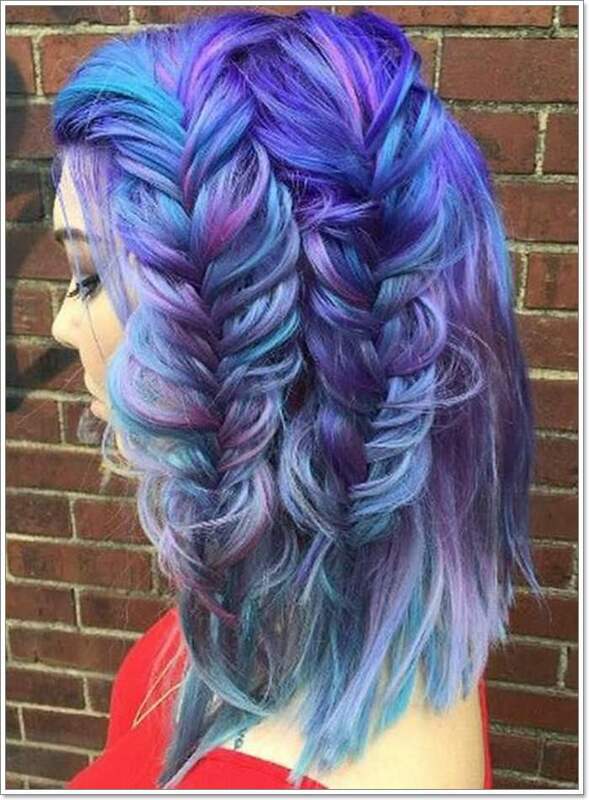 Better get down and start braiding your hair to get this beautiful mermaid look. Stay true to the look and incorporate some shiny hair accessories like the strand jewels in the picture. 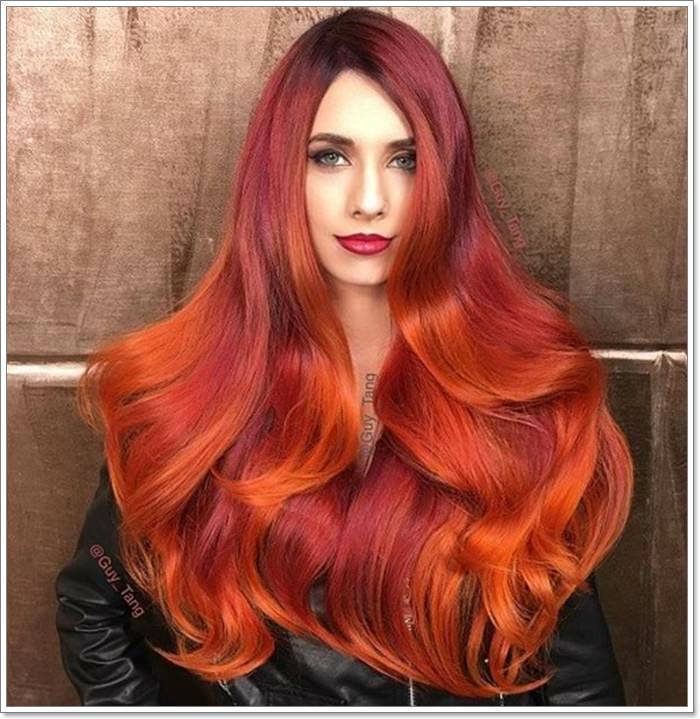 Honestly, red and orange ombre hair should be more popular for mermaid hairstyles, don’t you think? It perfectly captures the colors of the sea horizon during a summer sunset. 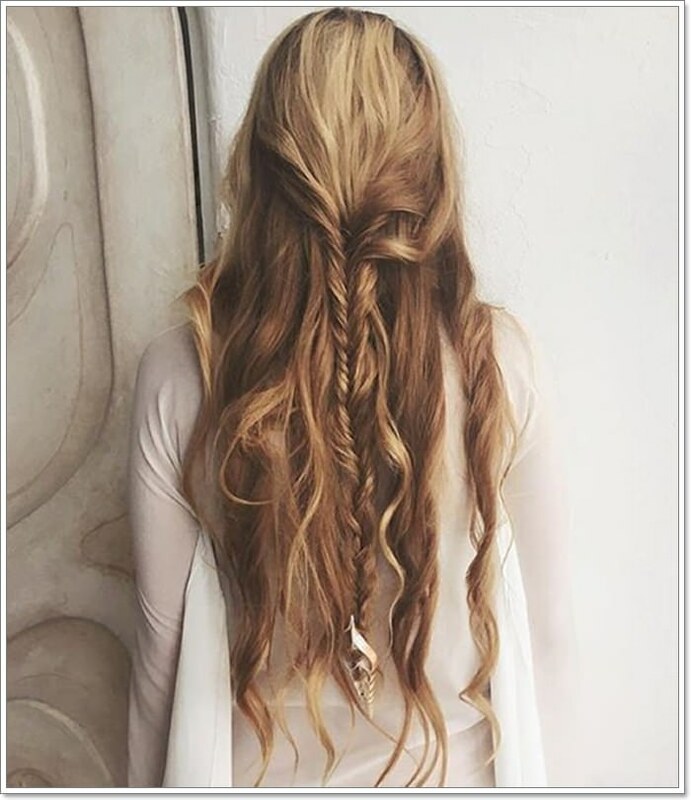 Layers on long hair give curls more volume and body. 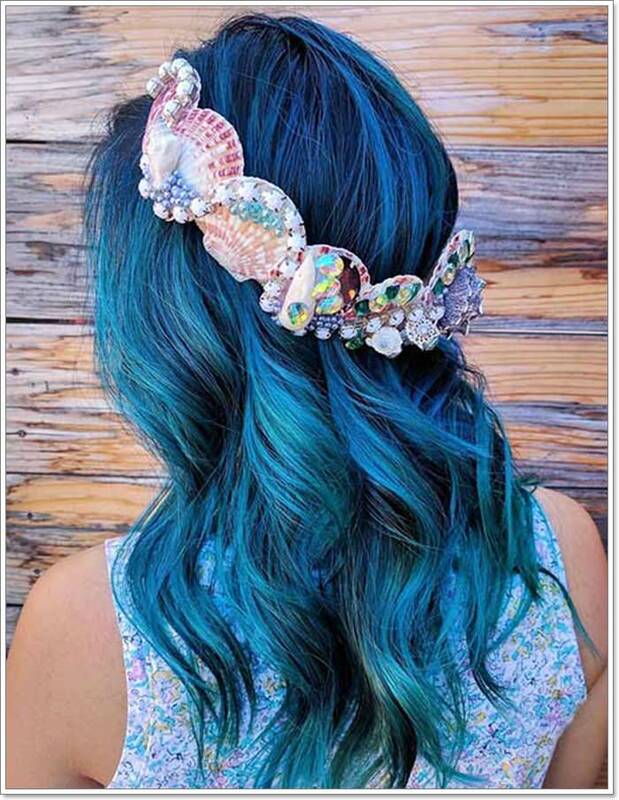 Incorporating pearl accessories should be a staple of mermaid hair. 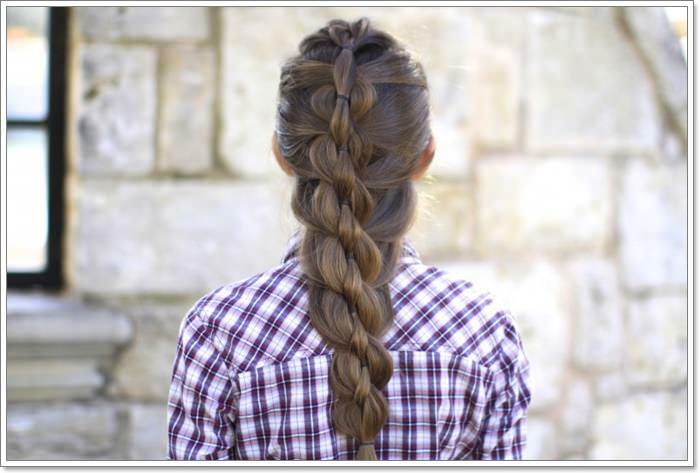 This pretty four-strand braid weave hairstyle is completed by a nice hair barrette. 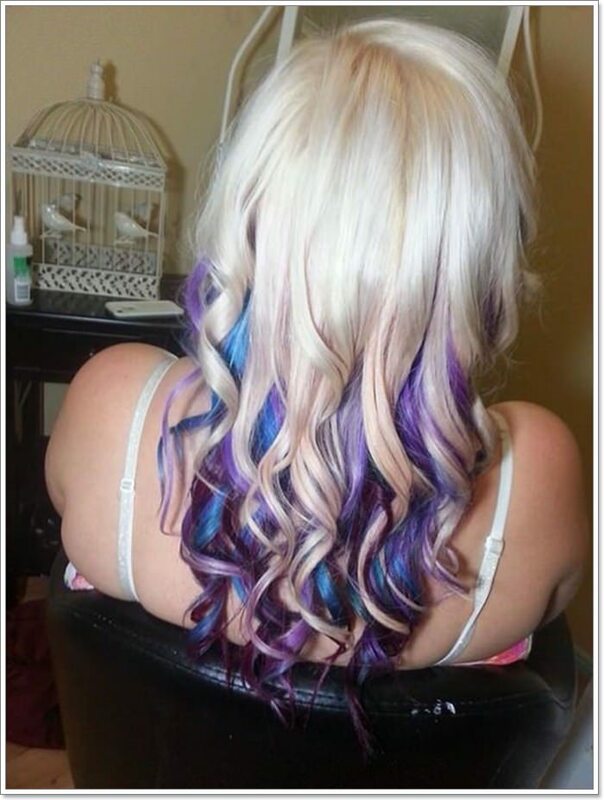 Add some playful curls to colored hair for a fun summer day look. 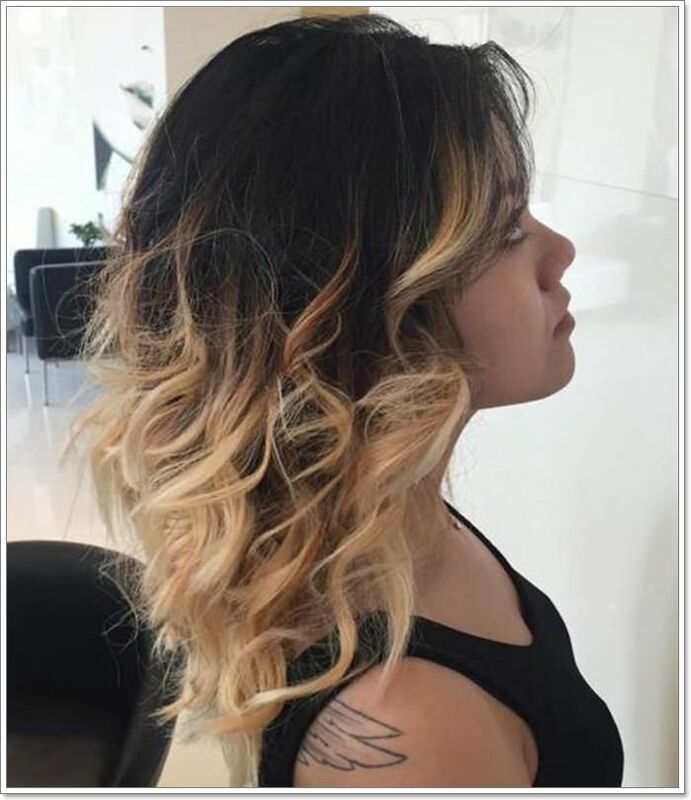 Looser waves give you a more laid-back look. 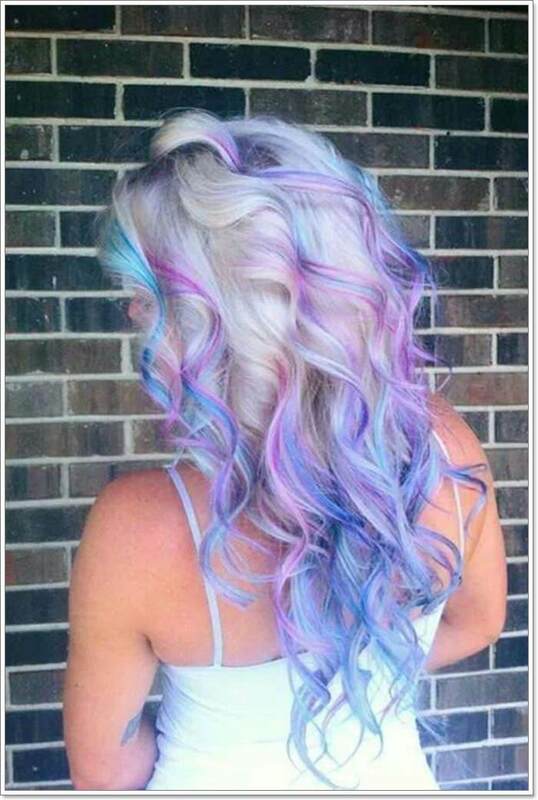 Another beautiful ombre mermaid hairstyle. 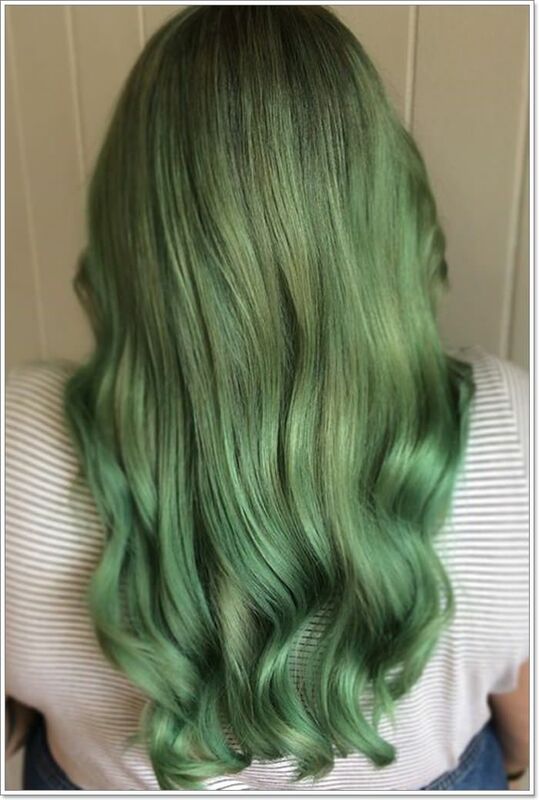 Blue green highlights and lowlights on dark hair? Yes please. Ditch regular braids and go for fishtail braids instead. 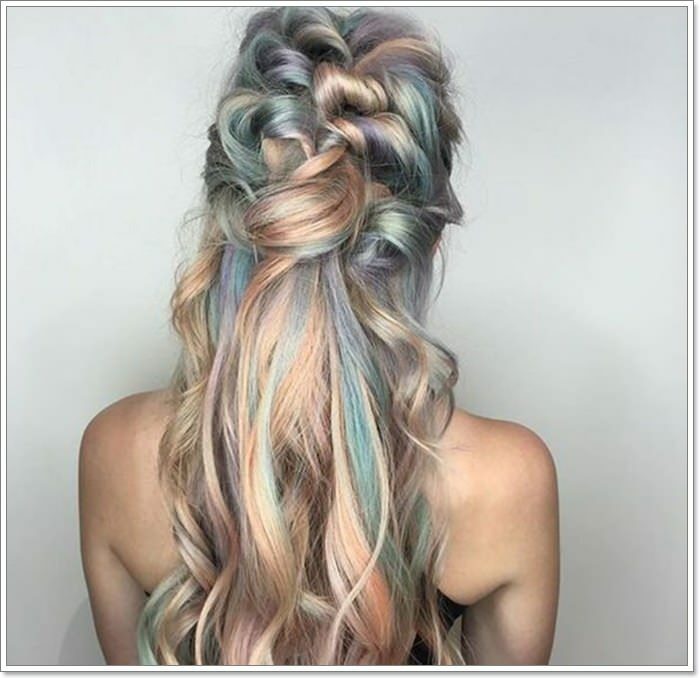 Style a lob with two-tier hair twists to emphasize a nice aquamarine and purple ombre. 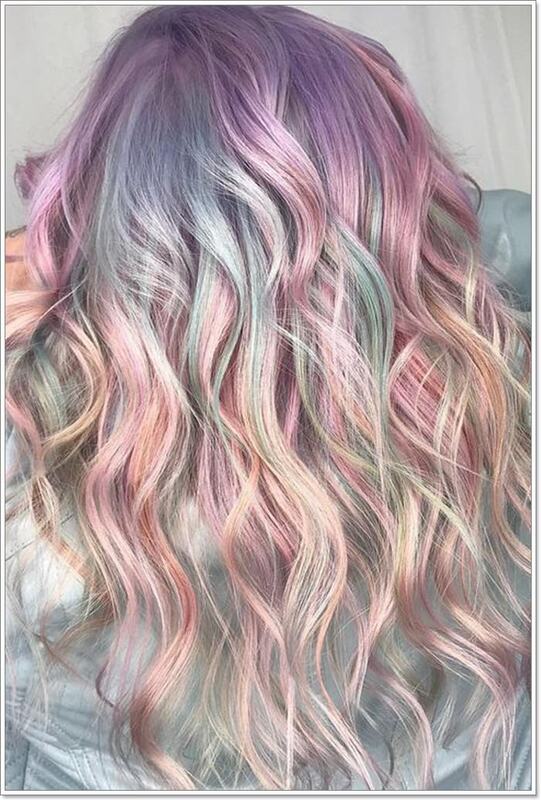 Who says mermaid hair can’t be funky? 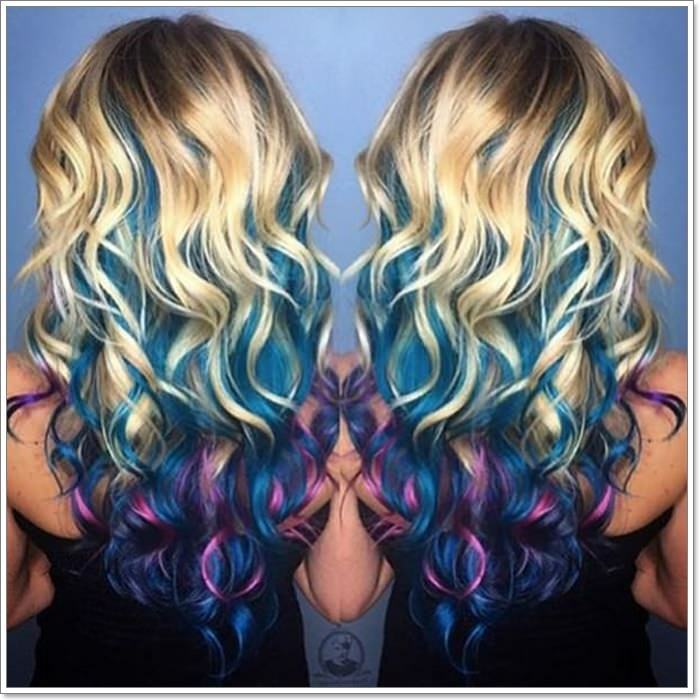 Go for chunky bright-colored highlights to achieve this look. 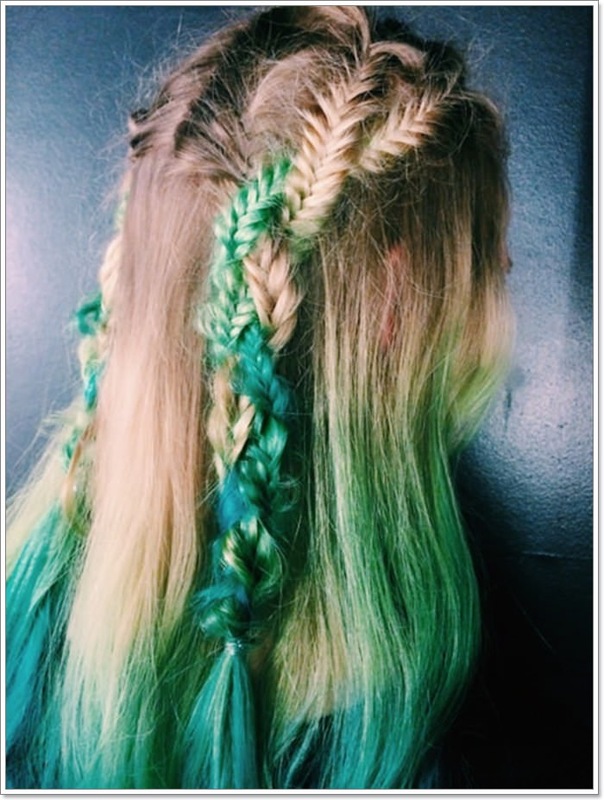 When we say braids are mermaid hair staples, we really, really mean it. Keep your hair safe from the sea breeze and tie it up in a braided bun updo. 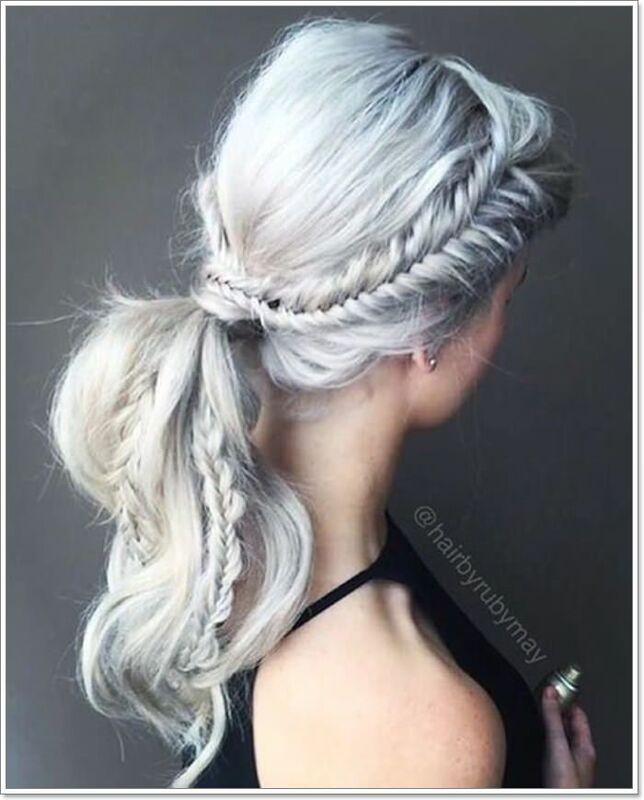 Keep some side hair tendrils to keep the updo looking casual. 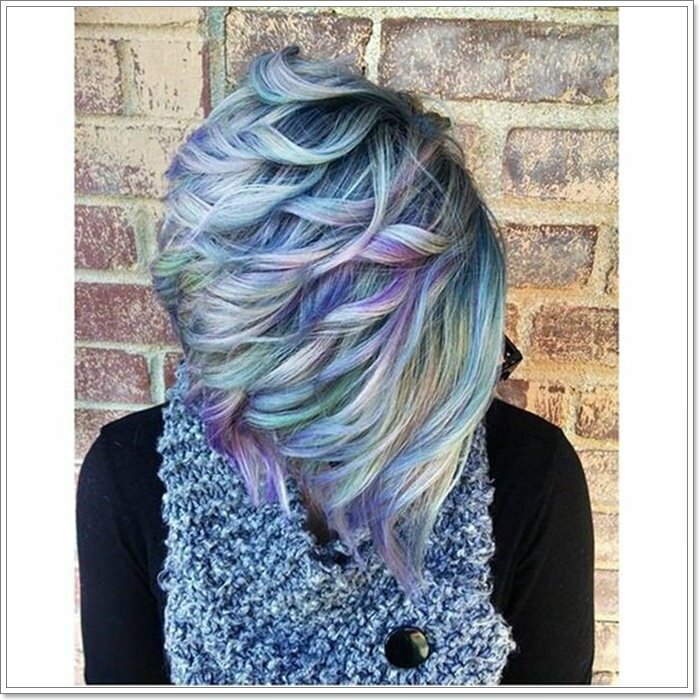 Cool colors like blue and purple mesh well with the lightness of silver blonde hair. 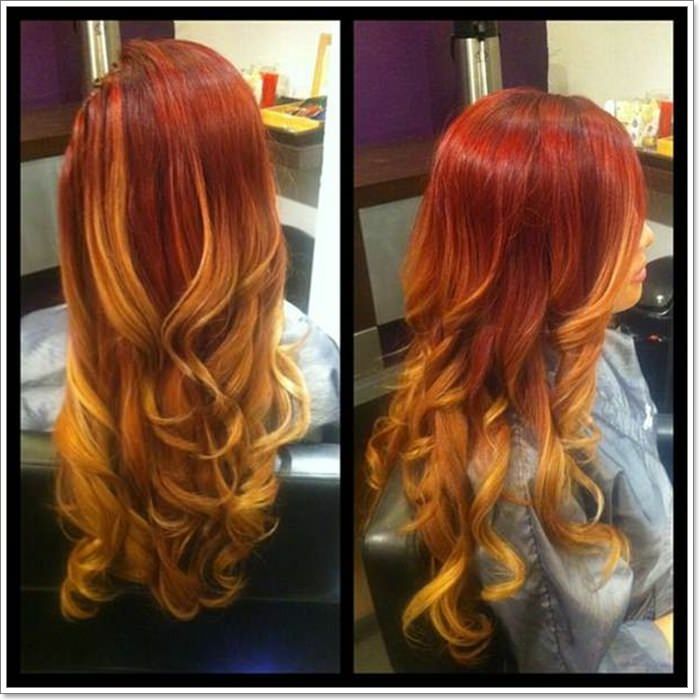 A multi-colored balayage dye job gives dimension to ultra straight hair. 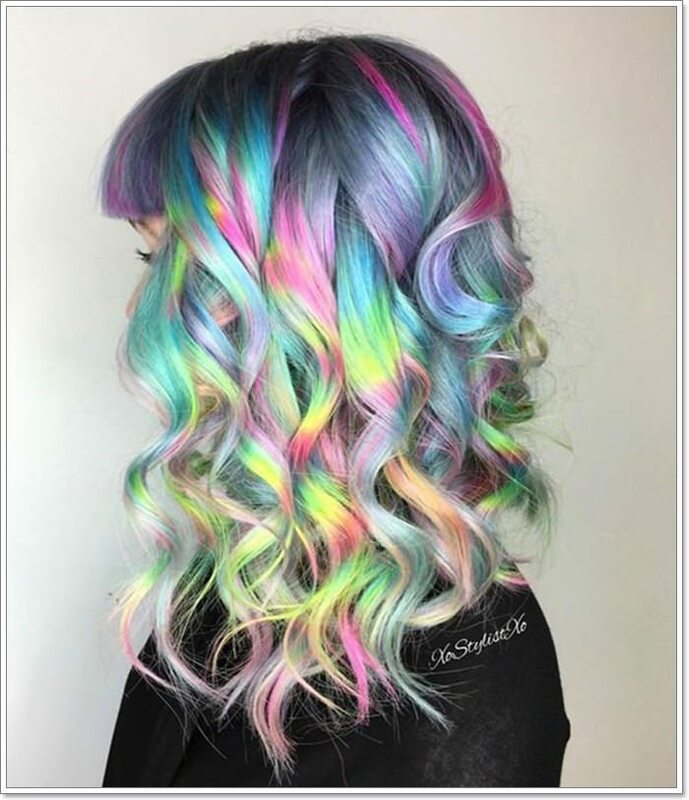 Curls always add movement to colored hair. Keep your hair moisturized and shiny to fight the heat of the summer sun. This Dutch braid updo is the perfect go-to hairstyle for beach parties. 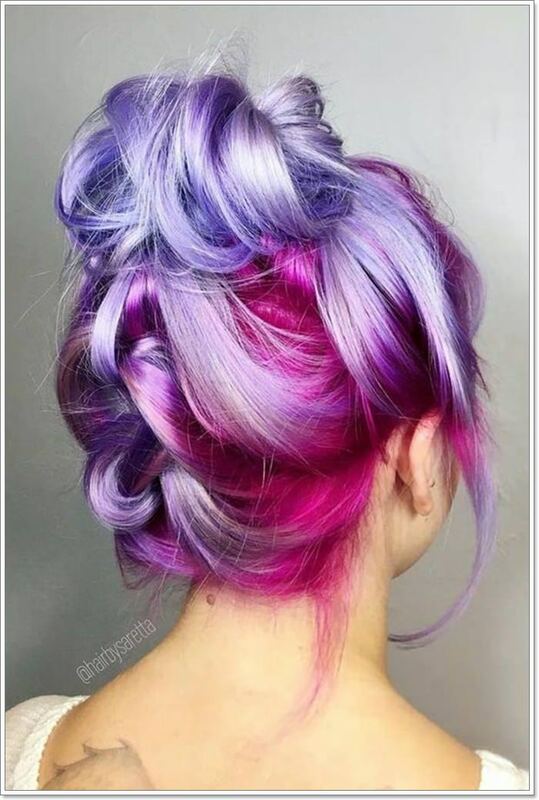 Keep updos just a bit messy and loose to keep things casual. 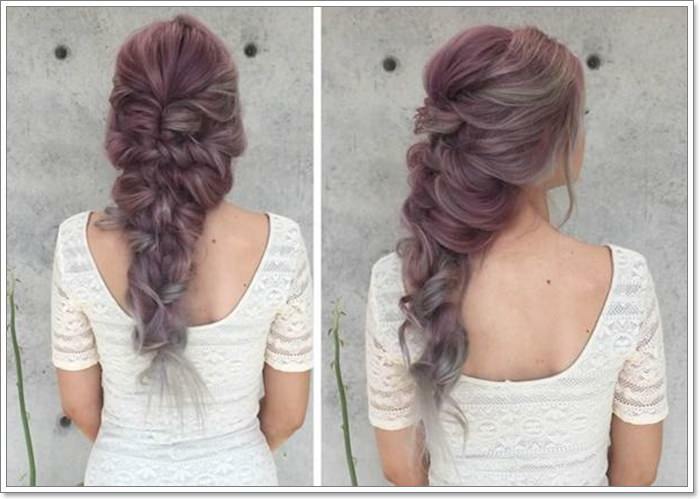 Give the illusion of having naturally purple hair by dyeing your roots a much darker shade. Blue green, dark blue and purple. 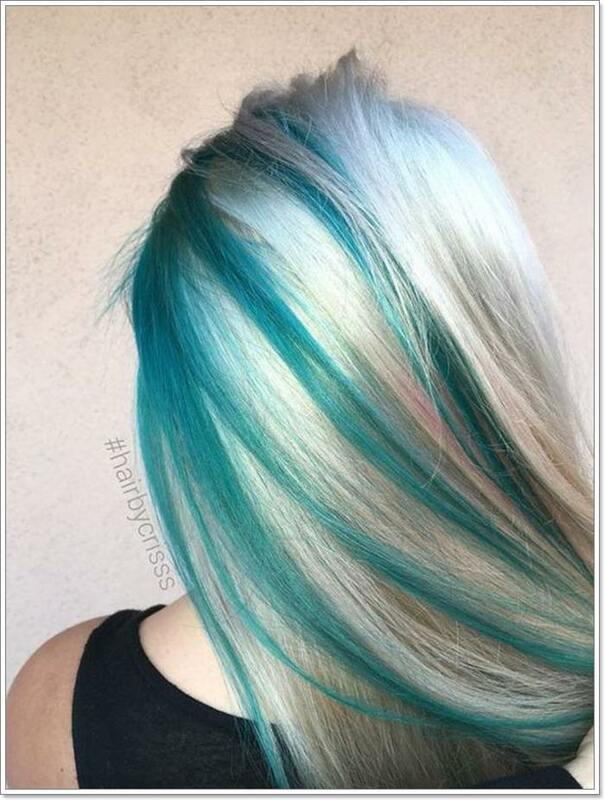 These are the only colors you need to recreate the deep sea onto your hair. Curl your hair in a variety of looseness and thickness to get the illusion of thicker hair. 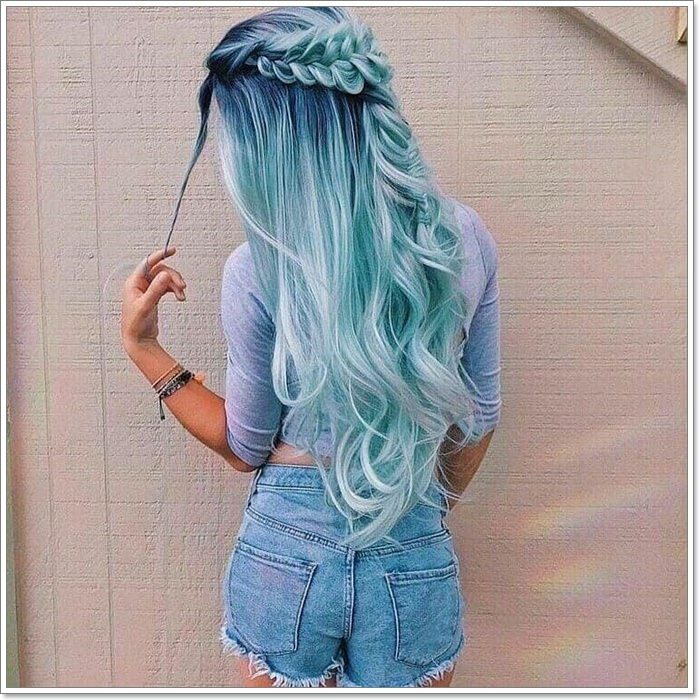 Long and thick hair is the ideal canvas for this mermaid hairstyle. Wanna know why fishtail braids are named the way they are? 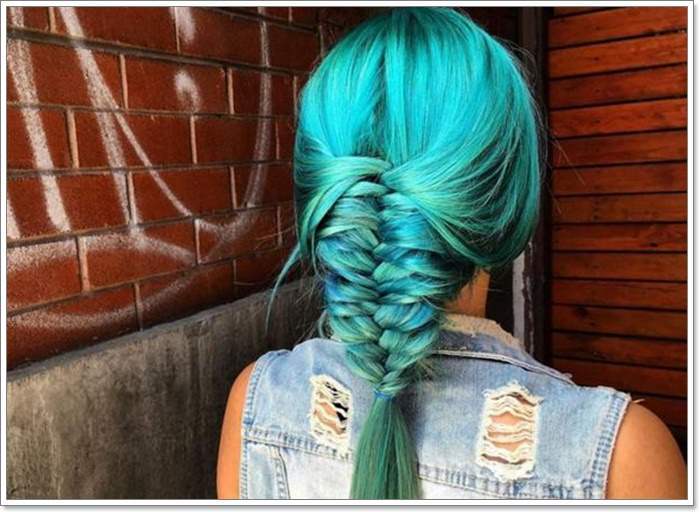 Take a look at this blue green ‘fishtail’ hairstyle. 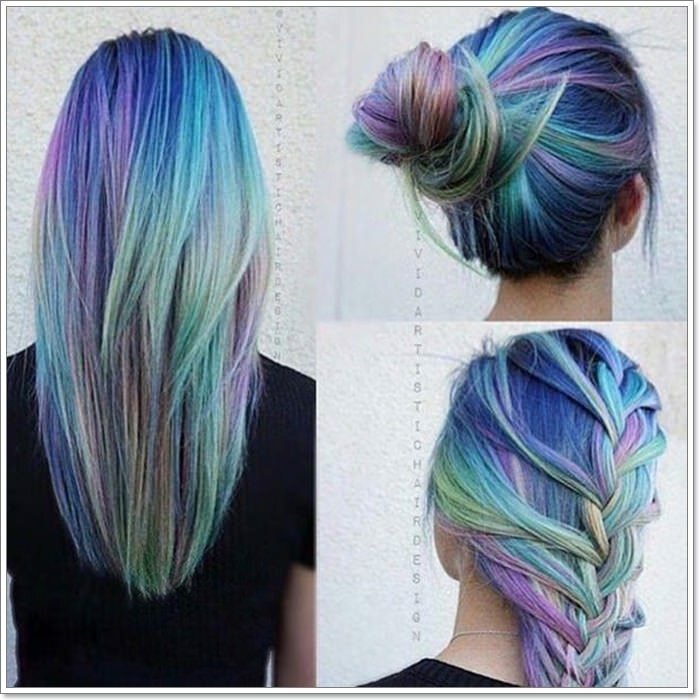 While the color combo on this looks more My Little Pony than a mermaid, it’s saved by its use of a Dutch-style fishtail braid. This hair is truly a work of art. 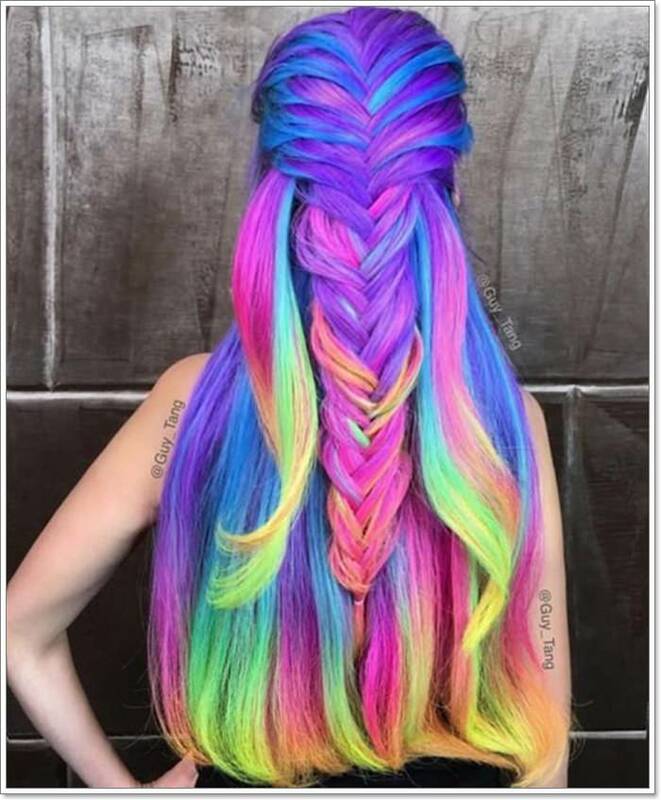 Notice how each color strand is done in ombre? Curly-haired girls are so lucky they can get away with uncombed bedhead hair easily. 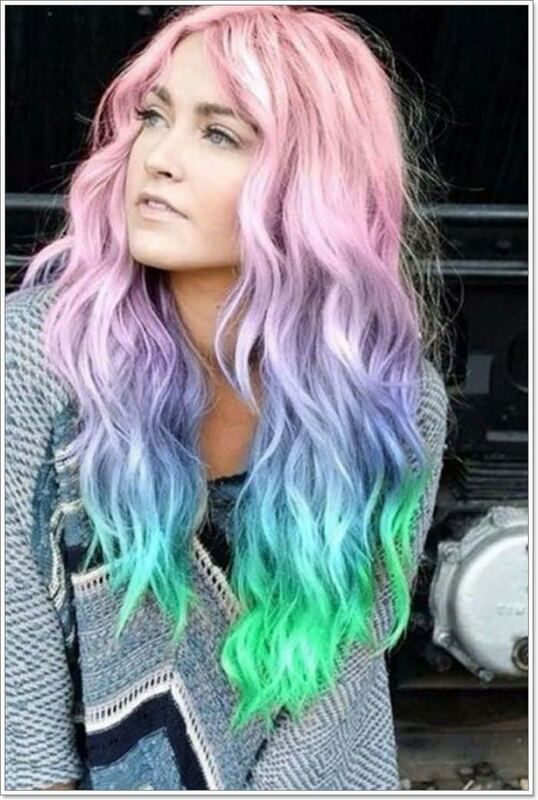 Just add some aquamarine and light blue highlights and they’ve got the mermaid hairstyle down alright. 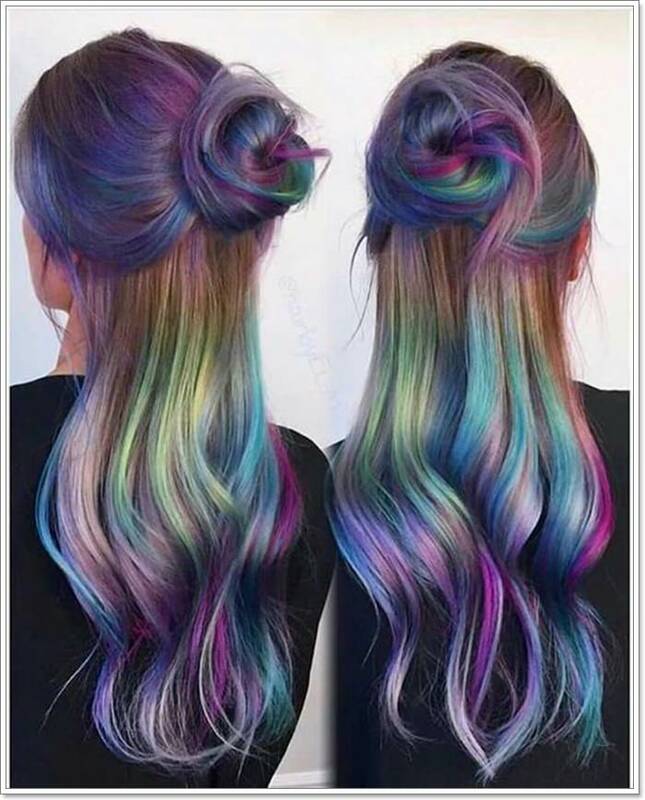 Half up hairstyles look great when paired with long multi-colored hair and loose waves. 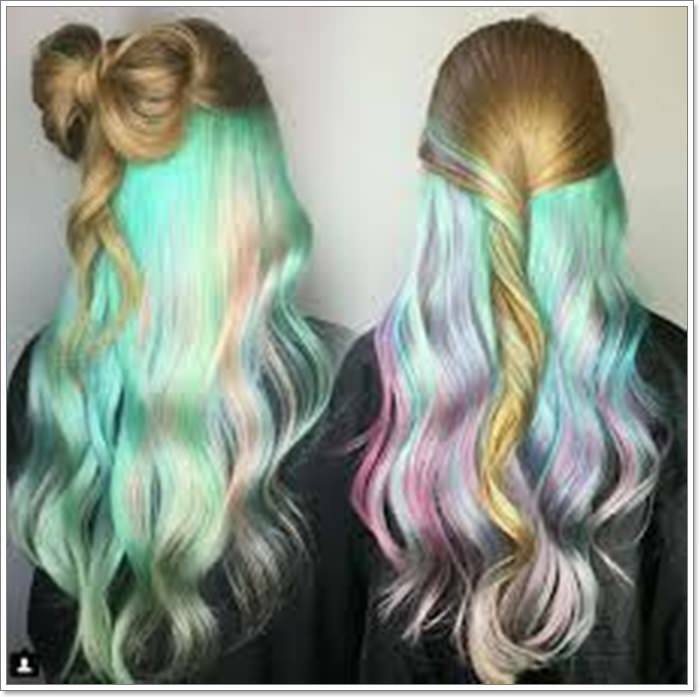 Bright pastel colors mix well with silvery hair for a classic mermaid hair color scheme. 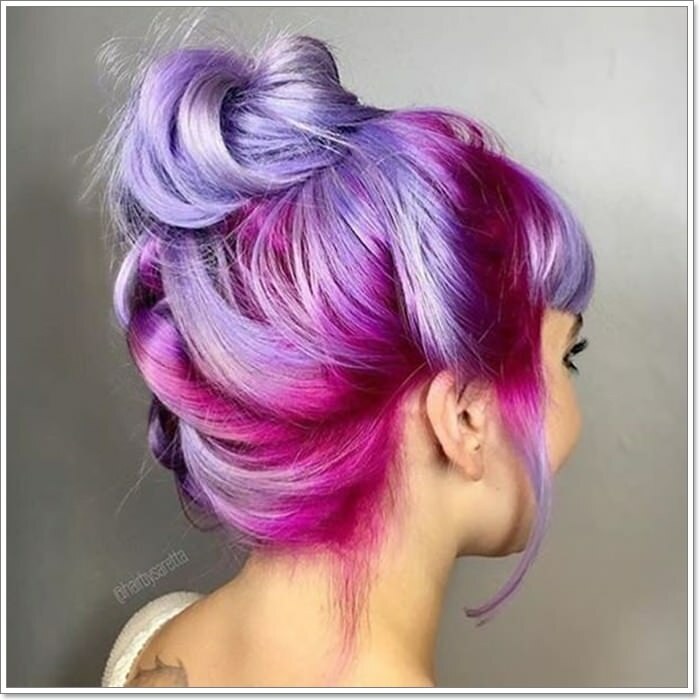 Half updos are the perfect way to display bright colored hair. 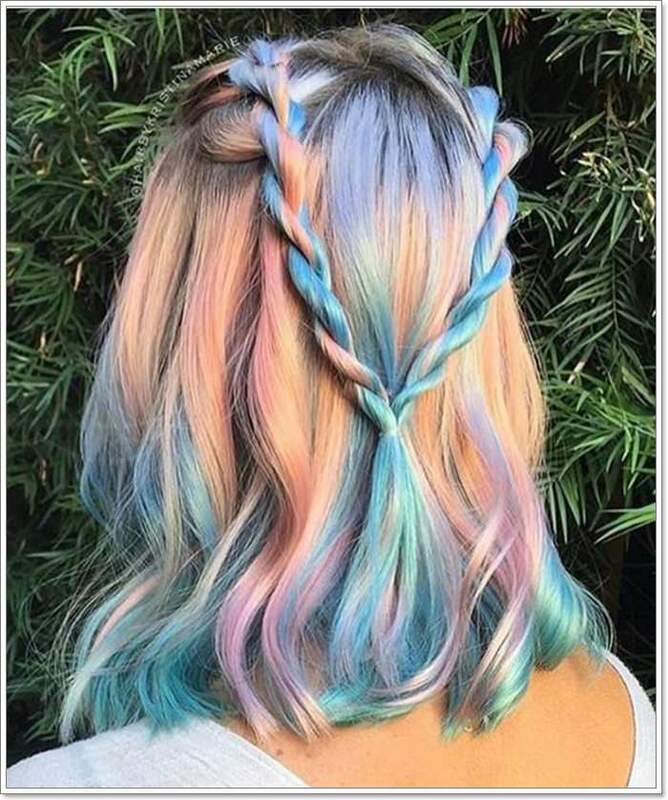 Pastel blue hair also looks great with dark roots. Go for an edgier look and incorporate a geometric and colorful undercut to your style. Did you know that braids can make flowers when wrapped in a bun? 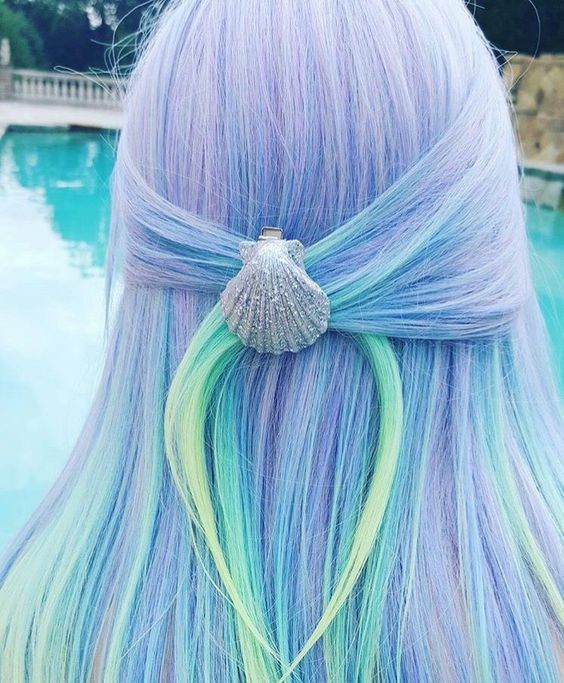 You don’t have to bleach and color your hair to get into the mermaid hair trend. 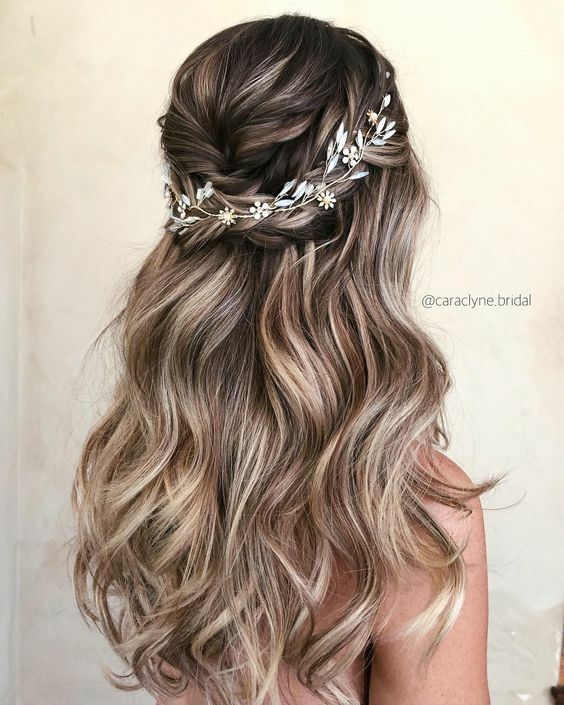 Some sun-kissed highlights and a messy braid also do the trick. 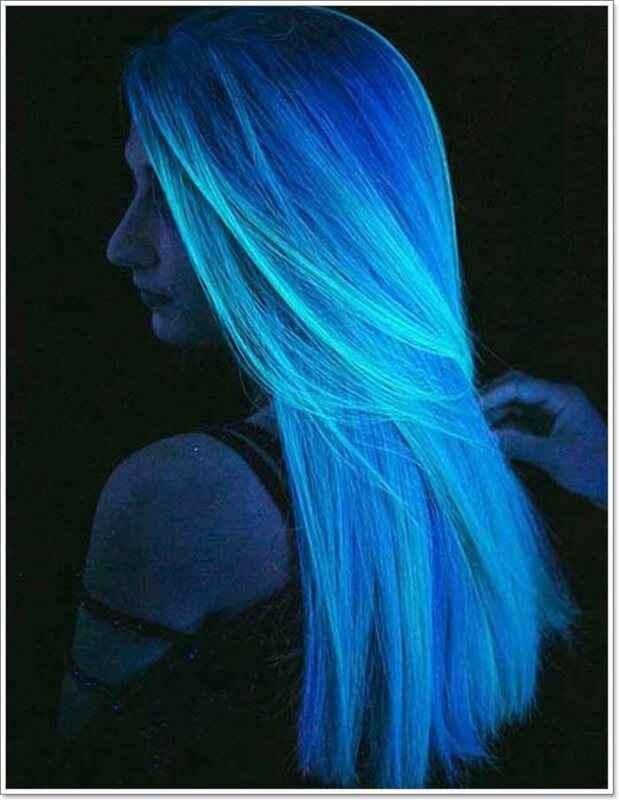 Is there anything more modern than glow in the dark hair? Black blue hair and a seashell crown? 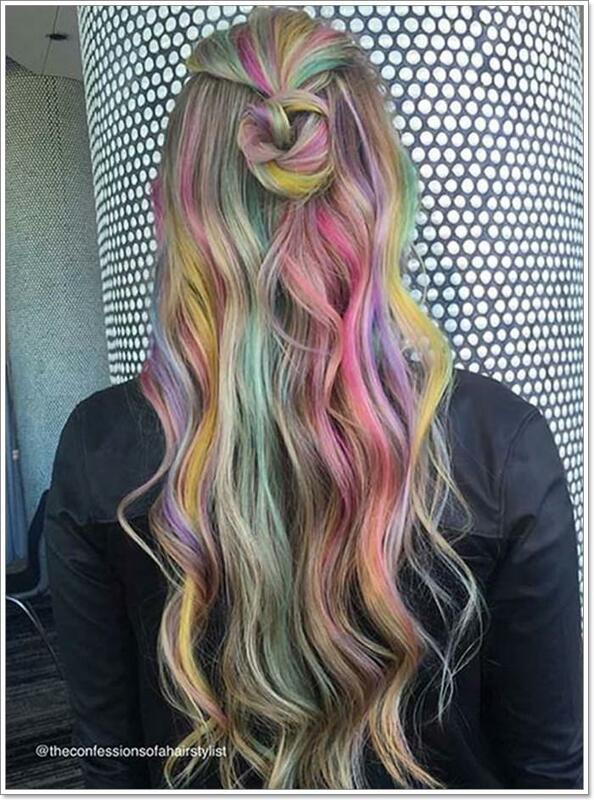 Now, that’s an easy yet foolproof mermaid hair look. The great thing about dying dark hair pastel colors is that it makes for a great dark roots and light hair combo when it grows out. 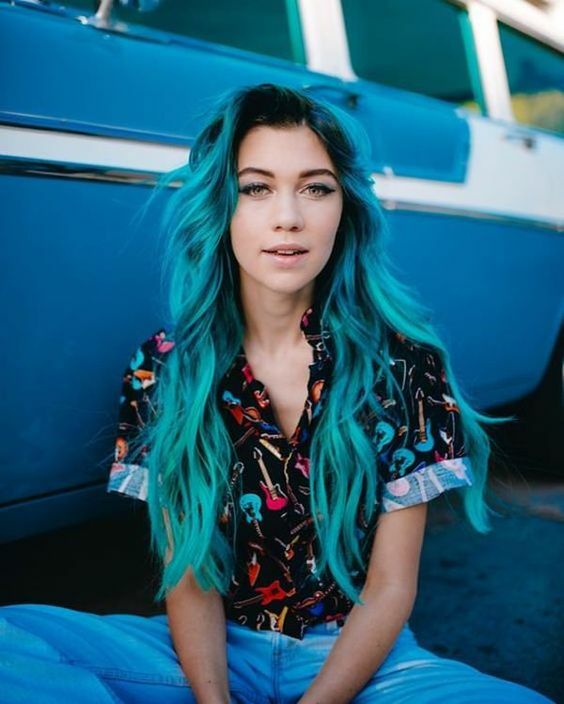 Brighten up pastel blue hair with some brightening blue green lowlights. Skip out on hair dyes and go for a more natural look. 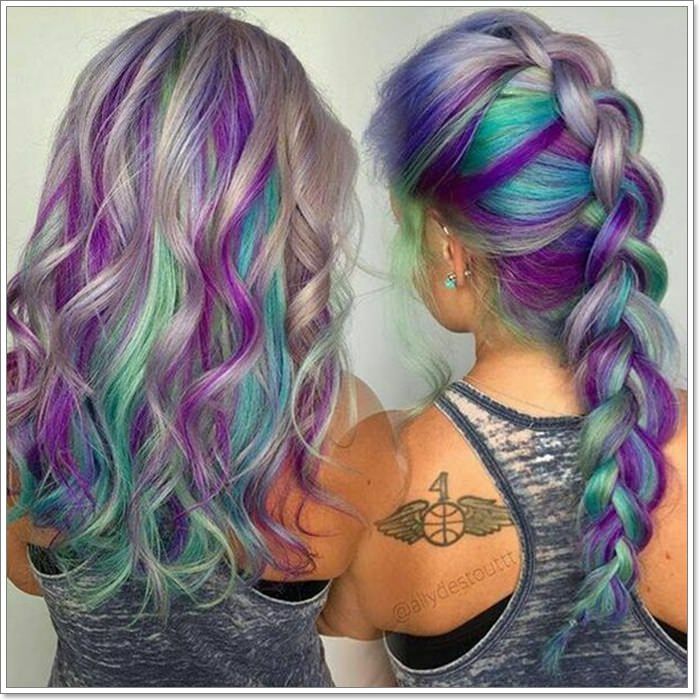 You can easily achieve mermaid hair by compensating with loose waves and braided hair. 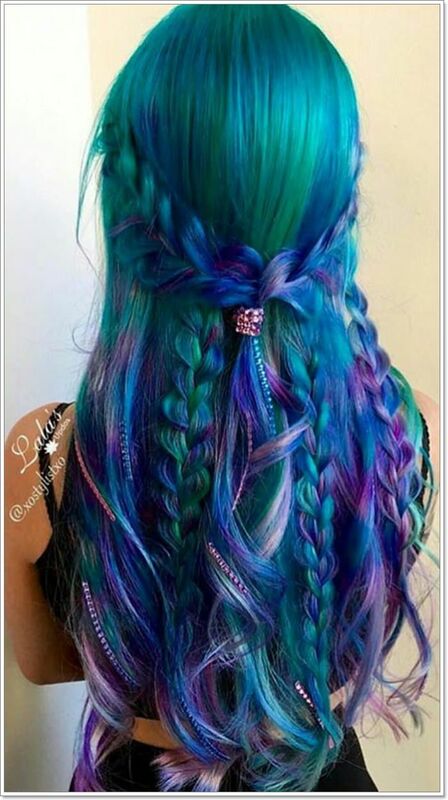 Leave some space on the bottom of braided hair to achieve this mermaid’s tail look. Better hit Etsy or Amazon to stock up on some seashell hair clamps before summer comes. 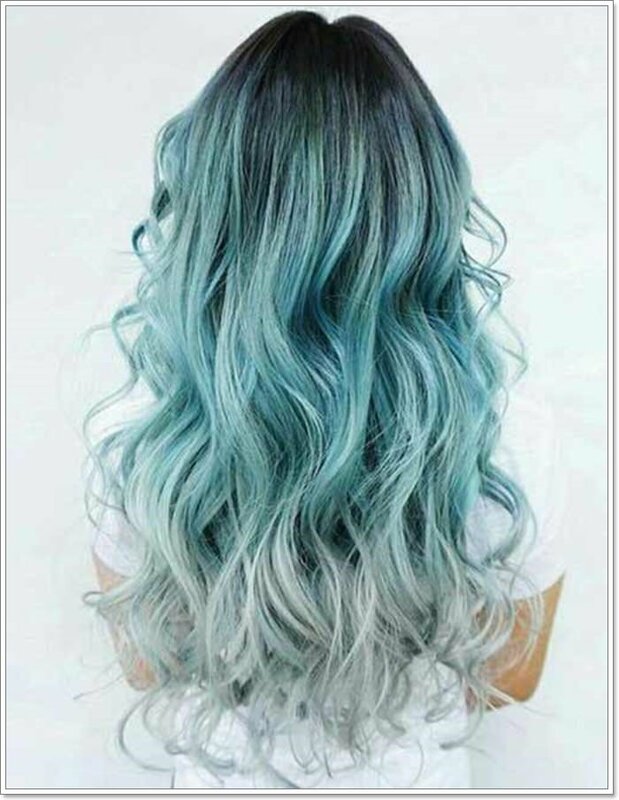 Keep things casual with messy hair and loose waves on aquamarine hair.